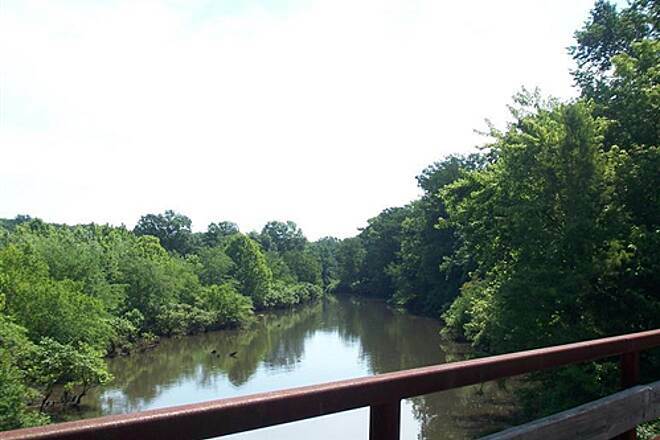 This gem of Illinois rail-trails was built on the former Cairo and Vincennes Railroad, which was completed in 1874 and hauled coal from southern Illinois mines, as well as produce and timber. Over the years, the railroad went through a series of ownership changes, and the tracks last belonged to Norfolk Southern Railroad, which turned the corridor over to the state in 1991. 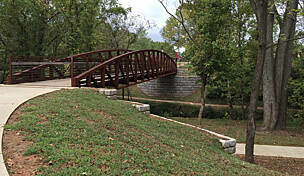 The first sections of trail opened in 1998. 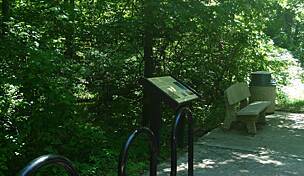 Beginning at the Barkhausen-Cache River Wetlands Center, you’ll encounter a gentle, uphill slope for 22.5 miles to the tunnel, where the trail crests and begins a downhill run toward Eldorado. 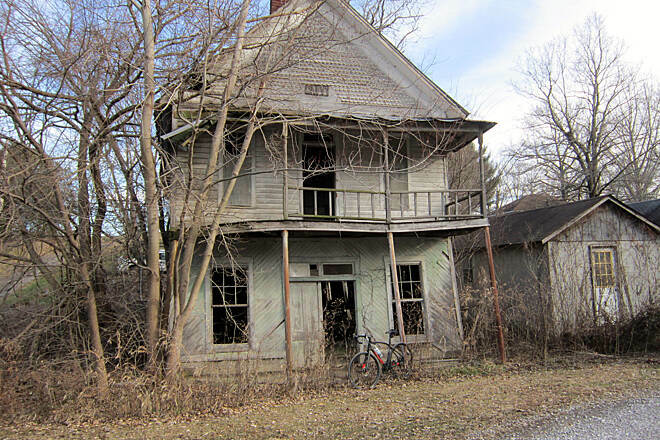 Several small towns and ghost towns are on this route, but services aren’t always available. It’s a good idea to refill water bottles when you can. The first 2.7 miles to Karnak run on a former spur line of the Chicago and Eastern Illinois Railroad. 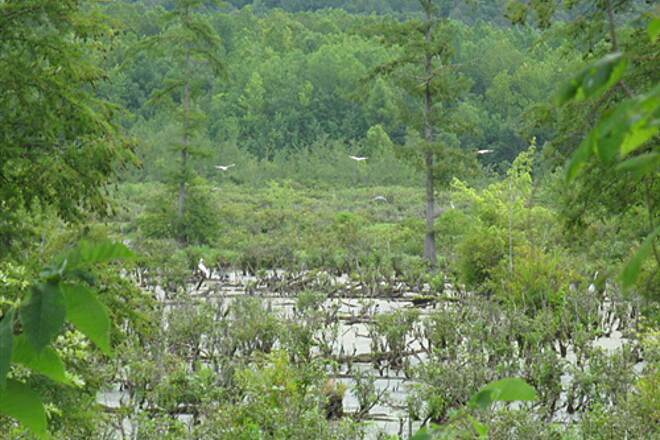 It passes through the swampy Cache River State Natural Area, which is home to giant cypress trees, some 1,000 years old. 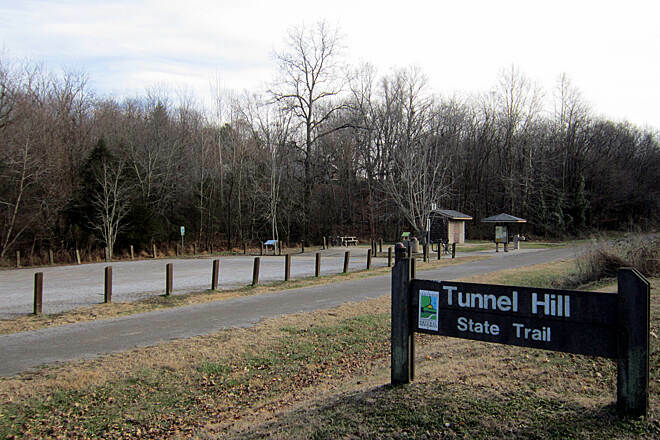 In Karnak, where a trailside campground opened in 2016, the Tunnel Hill State Trail bears left and picks up the railroad corridor. You’ll pass the Heron Pond–Little Black Slough and Cave Creek Glade Nature Preserves. About halfway to Vienna, look for the ghost town of Forman to your left. A trailside park in Vienna, 10.5 miles past Karnak, is a good stop, and cafés and groceries are available in town. 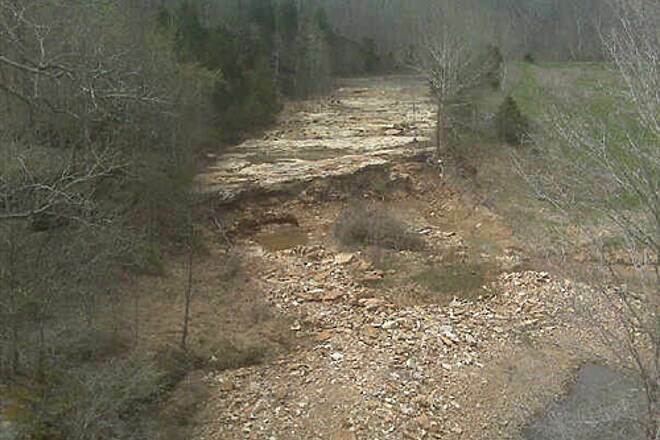 In 3 miles, you’ll probably notice the grade steepen just outside Bloomfield. The railroaders tried to keep these slopes as gentle as possible to save fuel and time. That’s why they dug a tunnel, originally 800 feet long, through the hill here, 6.7 miles past Bloomfield, instead of going over the top. A section of the tunnel collapsed in 1929. 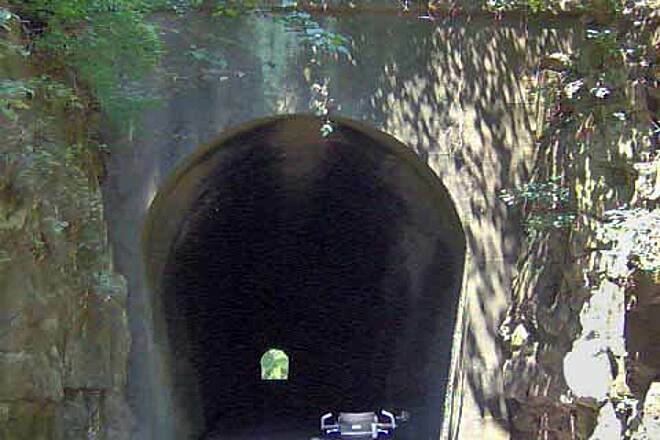 The remaining 543-foot tunnel is pitch-black inside, so be sure to carry a flashlight or bike light so you don’t scrape the wall or run into another visitor. 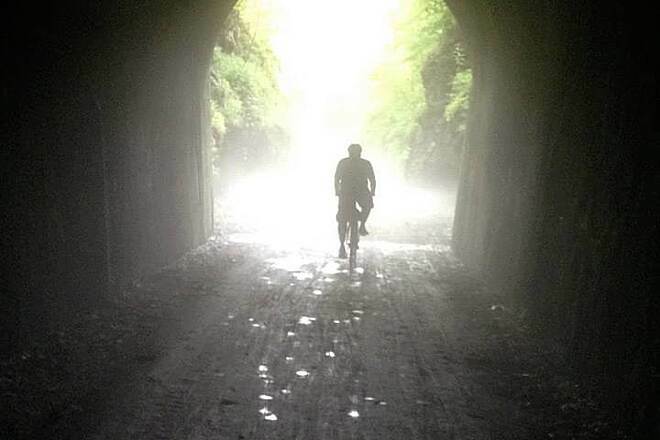 Back out into the light, you’ll find a fully stocked trailhead on your right in the town of Tunnel Hill, where the remaining 33-mile ride to Eldorado begins. 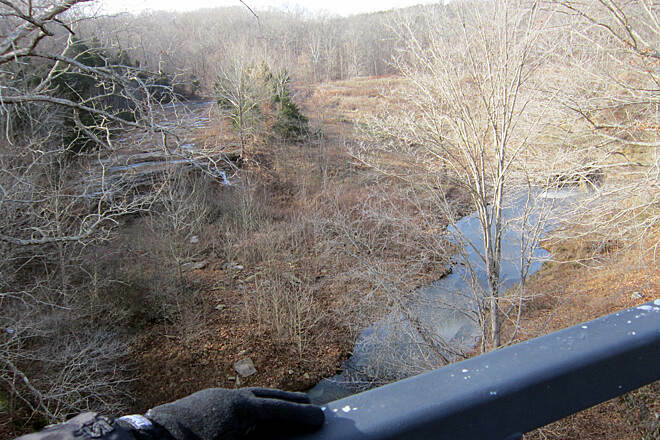 Entering the Shawnee National Forest, you’ll find a stunning landscape, with a high tree canopy that shades a trickling brook on the right. You’re more likely to hear the birds here than you are to see them, but the local rabbit population is everywhere. 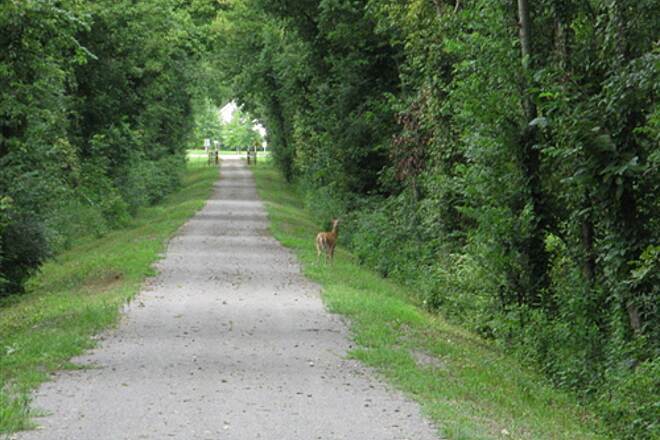 Users often report seeing deer and turkeys along the length of the trail. After 6 miles, you arrive in the town of New Burnside. Looming bluffs mark the terrain here, providing a dramatic contrast to the forest you traveled through earlier. 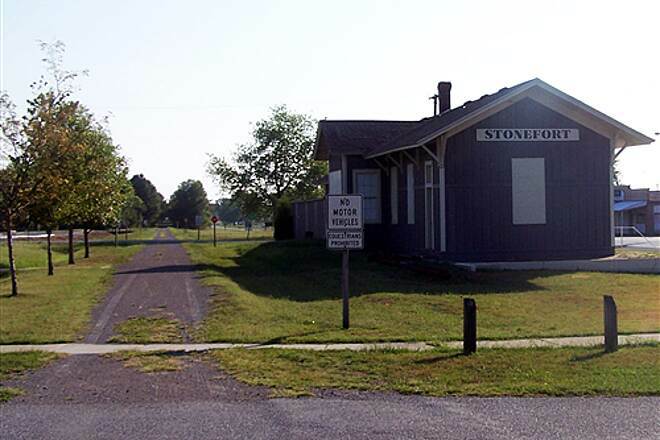 Another 4.4 miles takes you along a flat section along US 45 to Stonefort, whose trailhead includes a well-restored railroad depot. The next 6.7-mile stretch remains within sight of US 45 most of the way to Carrier Mills. Keep an eye out for turtles and snakes, which also like to use this trail. 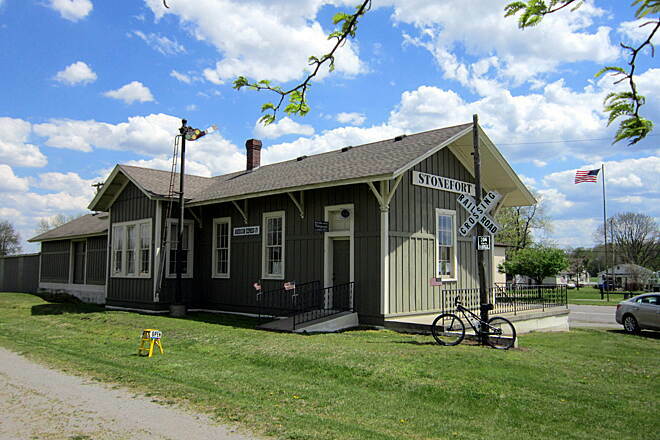 The next 7.5 miles meander past farm fields and the outskirts of Harrisburg, the largest town on the trail. You’ll spot restaurants, grocery stores, and motels as you pass through. From the trailhead on the north side of town, it’s another 8.2 miles to the endpoint in Eldorado. 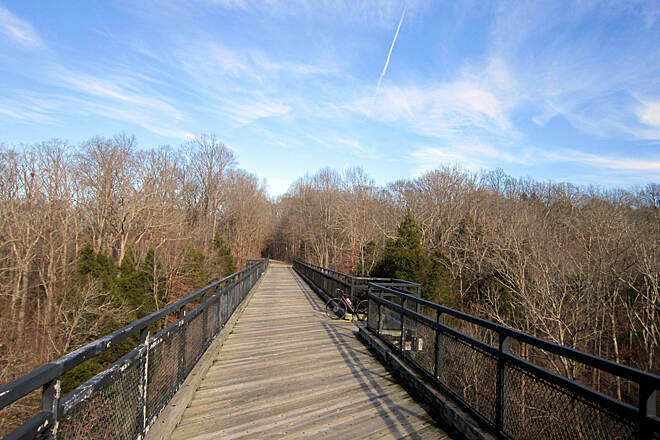 The trail crosses IL 13, spans a bridge over the Middle Fork of Saline River in Muddy, and continues alongside US 45. 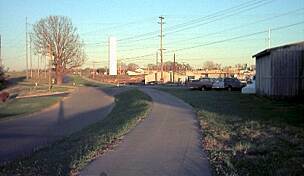 Near your destination, you cross the 2-mile crosstown Eldorado Bicycle and Walking Path, another rail-trail. To reach the Barkhausen-Cache River Wetlands Center near Cypress: From I-57, take Exit 24 and go east on Cypress Road/Dongola Road. Go 8.3 miles and turn right onto IL 37, following signs to the Wetlands Center. 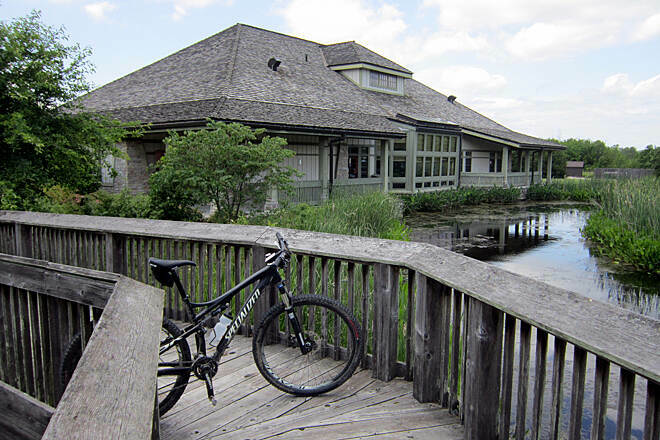 Go 2.5 miles and turn left into the Barkhausen-Cache River Wetlands Center, traveling a short distance to trail parking. 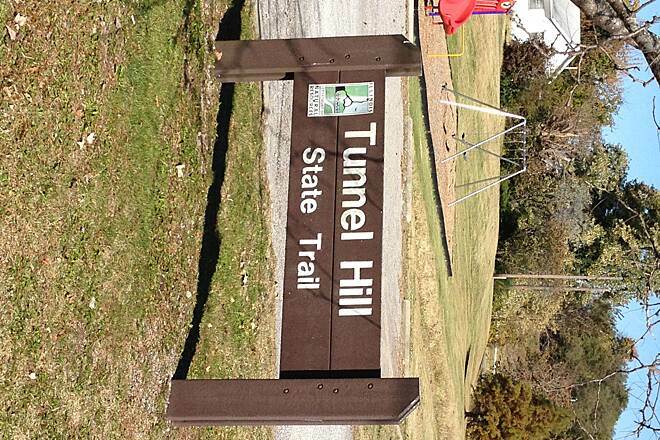 To reach the trailhead at Tunnel Hill: From I-24, take Exit 14 to US 45 and head north for 5.8 miles. 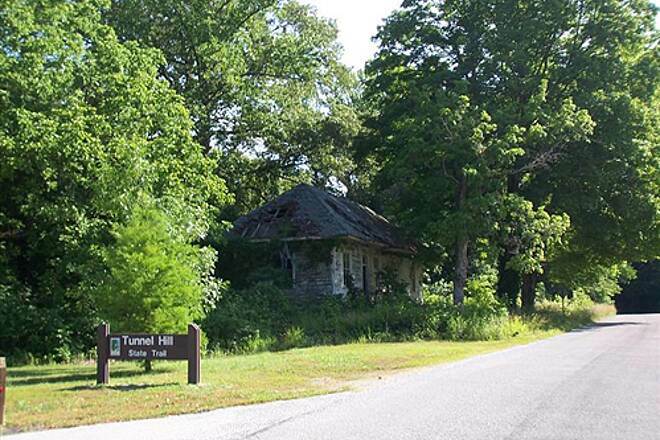 Turn left on Tunnel Hill Road, continue for 1.0 mile, and look for the trailhead on the right, just before Possum Rd./Main St.
To reach the Harrisburg trailhead: From I-57, take Exit 54. Continue on State Route 13 east for 24.2 miles. Turn right on US 45/N Commercial Street and head south for just 0.1 mile. Turn right on Walnut Street then right on Veterans Drive. The trailhead is on the right. To reach the Eldorado High School trailhead: From I-64, take Exit 110 and head south on US 45 toward Norris City. Go 21.4 miles, and turn right to remain on US 45. In another 11.2 miles, turn right onto Alexander St. in Eldorado. Go 0.5 mile and turn left onto N. Main St. Go 0.4 mile and turn left into an unmarked drive that heads into the Eldorado High School sports complex. 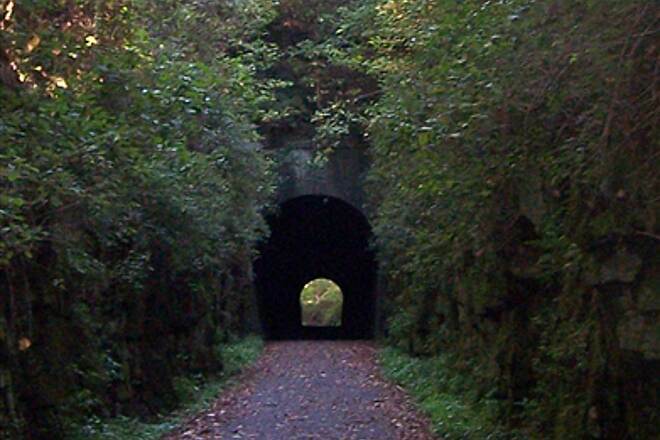 The Tunnel Hill State Trail begins 0.2 mile ahead. 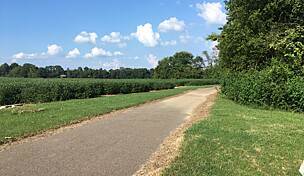 I've been looking forward to biking this trail for a couple of years, but my ride on September 9th from Harrisburg to Karnak left me feeling rather underwhelmed. 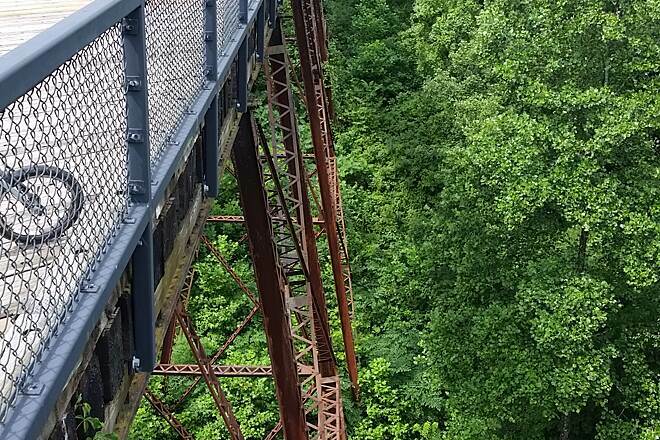 Much of the trail surface was rough from motorized vehicle tracks, wash-outs had been repaired with white rock instead of finely crushed limestone, and the bridge decks rode like rumble strips. There are mile markers on the trail which I assume correspond to the old railroad line because they were in the triple digit range, but they aren't printed on any map so are useless. If I had it to do over again I would do an out-and-back between Karnak and Tunnel Hill. This section contains most of the trestles and of course the tunnel. Vienna has several restaurants; Jumbo's had a nice Sunday buffet and was only .6 of a mile off the trail. I'm sure those who live within an hour or so enjoy using this this trail, but it really wasn't worth the 3 hours I drove to get there. Great ride from Vienna to the tunnel and back. Bridges and tunnel are awesome and so is the scenery. First time on crushed limestone and I think it rides like pavement, although it will really dirty up your bike. Loved this trail and want to do more of it! New BBQ Restaurant in Stonefort, Free water for your bottles!! Very accommodating staff, right off the trail across Rt 45. Great food,free water and places to charge your phone if needed it's the only water stop after Tunnel Hill! The water fountains in New Burnside and Stonefort are out of order!! Very clean establishment! The City of Karnak has just opened a campground alongside the trail. 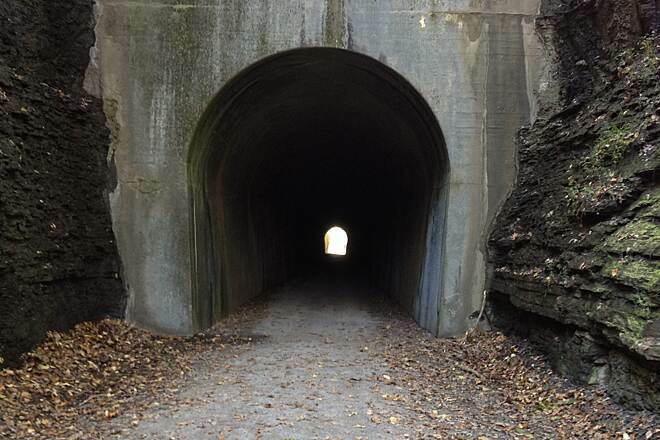 Karnak is situated at the southern end of Tunnel Hill Trail (about 2.5 miles north of the Barkhausen Wetlands Center.) Current sites are only suitable for tents but they have plans to open up RV sites (water/elec)soon. $10 a night, no showers but there is water. Each site has a picnic table, fire ring and the city provides the firewood. Several nice little cafes and a grocery store are within 2 blocks. If anyone is looking for a great weekend getaway to try out bike camping this is the perfect opportunity. To make a reservation call Karnak City Hall, 618.634.9311. Actually road part of this back in August 2014. Started in Vienna, Il. and road up to the Tunnel Hill stop. Love the bridges and the shade. Packed a small cooler with me for lunch and water. Riding in the tunnel was freaky!! All you can see once you are in is the light at the end of the tunnel, literally! Plan on going back this year with the wife and do just a downhill part. This ride was my first 25 miler. Father's day weekend we parked at the Wetlands Center, very nice center and extremely helpful staff. We left the center and headed for Harrisburg, trail condition was very good,solid, and smooth.The main complaint is the LACK of water. Vienna was the only trailhead with a working faucet.We spent the night at Eco lodge in Harrisburg. 60$ for the night,clean rooms.MORELLOS,was our choice for supper, very good food.Overall good trail.might do it again in cooler weather. On June 29th 2016 I rode from Tunnel Hill to Karnak, at the southern end of the trail, and back. I got a rather late start so I opted not to do the short wetlands section going west out of Karnak. The temperature that day was in the low eighties with fairly low humidity which is not typical for this time of the year here - think subtropical! There are great lengths of trail in the deep shade and they were noticeably cooler after coming out of the sunlit portions. 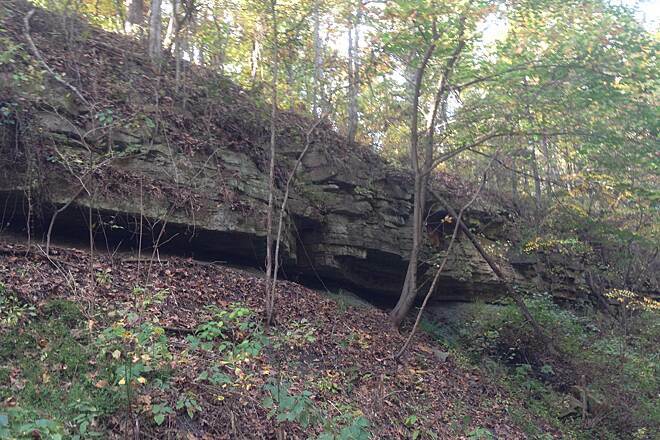 The terrain is full of limestone outcroppings, heavy forests, and many small creeks and rivers running in deep cuts through the limestone bedrock. There are long stretches of trail with no road crossings and there are two cast concrete tunnels under busy roads. The trail has a very rural feel to it and one could imagine in many places that this is the way the country looked to the pre-Columbian inhabitants of the region. 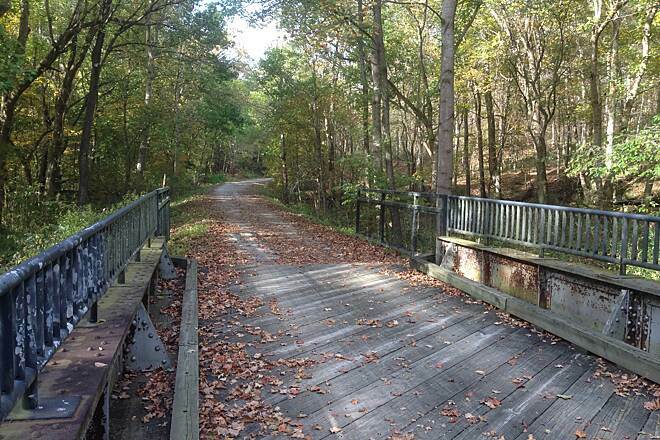 Vienna is at the midpoint of the southern half and has a beautiful park on the trail. It is also the only settlement of any size on the southern half. 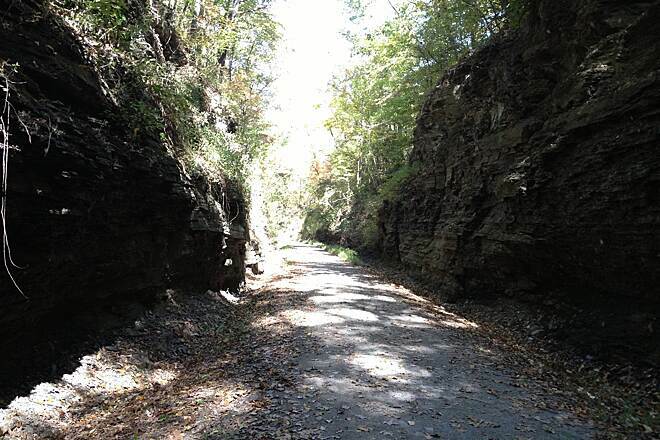 The trail itself is paved with crushed rock and crushed limestone and is in very good condition. I had 32 mm touring tires on my single speed and had no handling problems what so ever. Experienced riders could use smaller tires with a little sacrifice in comfort. Just south of the tunnel there is a bike rental place with water and cold drinks for sale. Take note that water stops can be far apart! Also note that riding through the tunnel can be very disorienting. Coming into it out of the bright sun, even with a pretty good headlight, your eyes can't adjust quickly enough to see anything but inky blackness all around you, except for the other end of the tunnel which is large enough and bright enough to keep your eyes from readjusting. It was a strange experience and it would be very easy to scrape the tunnel wall or crash. 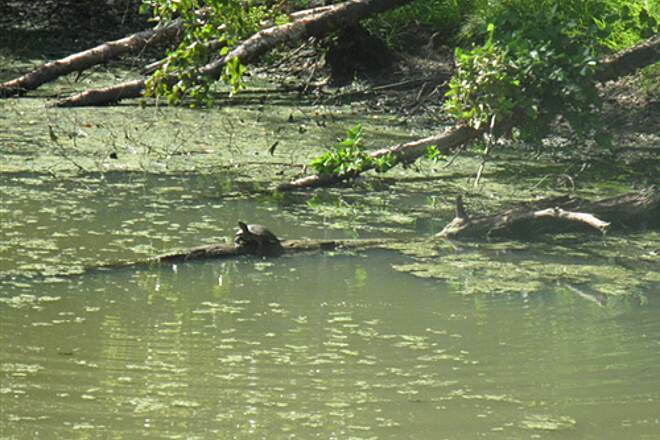 Aside from the many birds the only wildlife I saw that day were two small snakes and a turtle. 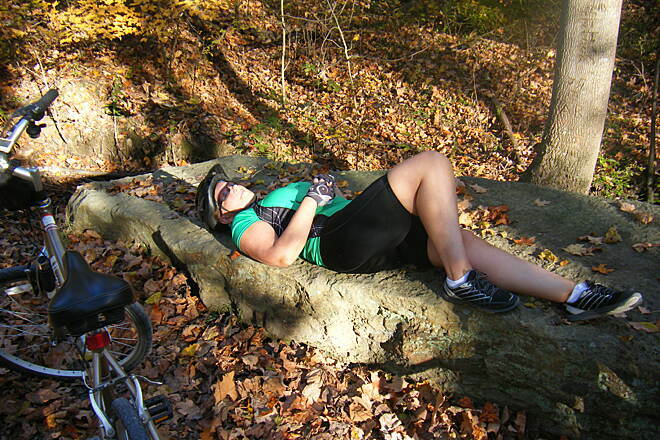 I really enjoyed Tunnel Hill Trail and look forward to riding it again soon. 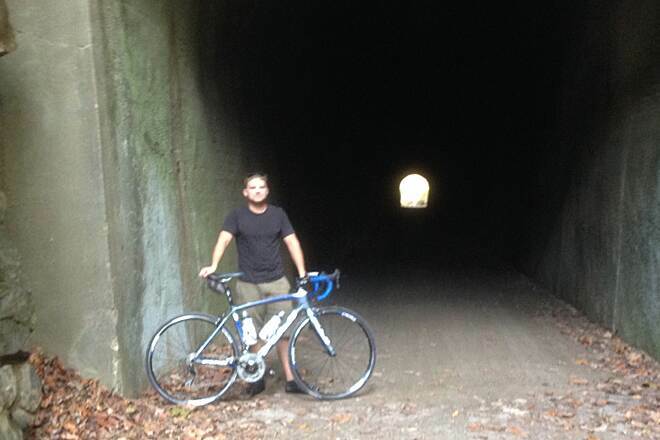 Two first on this ride,,,, My first Tunnel trail and my First Century ride !! 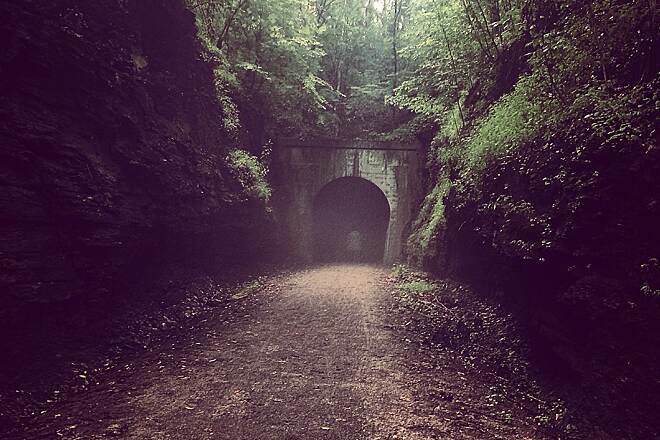 I rode here yesterday (6/28/16) for my second Rails-to-Trails ride and my FIRST ever Tunnel ride. The trail was good and packed and I had no problem with loose gravel at all. My 700x32's rode well @ their max of 80 PSI. There are mile markers along the entire trail. I only wish there had been signage showing mileage from town to town. Lots of wildlife along the way,, Deer, Turkey, Squirrels and a SNAKE !! What a beautiful trail system you all have there in Illinios. ALSO,,, just a note of observance,, if you plan to ride the entire length and are concerned about the sun. The trail is covered very well with shade from just south of Harrisburg to Karnak. So,, riding the northern part in the early morning would be best and saving the southern part for the evening temps. 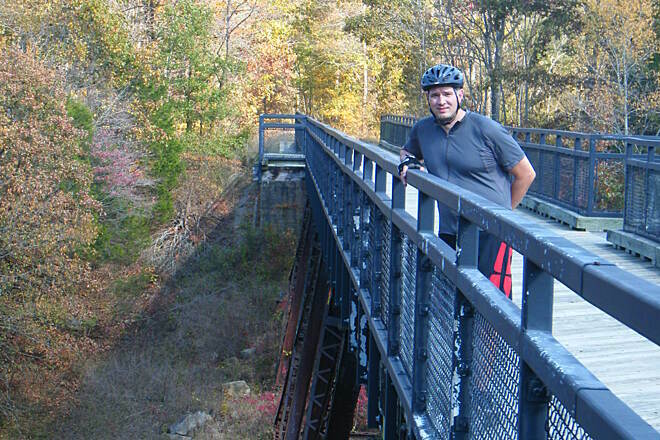 My wife Linda and I rode the trail from the Cache River end at Karnak to Vienna (pronounced "VIGH", as in "high", "enna" the first day and from Vienna to New Burnside the second. While the trail from Vienna to New Burnside is more scenic, the southern section merits riding as well. If you wish to start at the south end, unless you're an early riser, start in Karnak, at the parking area on IL 3 (S. Franklin St.) just north of town center, off IL 169 (Washington St.) You'll find a pit toilet there and what would seem to be more parking than that end of the trail will ever need. 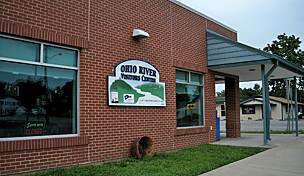 While there's ample parking at the Cache River Nature Center, 2.5 miles to the west, the Center locks its gate at 4:30 pm. Still, I recommend the detour to the center. The Center features an extensive display about the area's history and the efforts to restore the area following its despoliation by agricultural and logging interests. If you ask, the ranger will tell you about some of the local forests, including a couple of "Illinois champion trees" in nearby bogs. At this time of year, you can also see a few pollinator gardens that the staff planted along the main path. It's easy enough to bike back to the center from Karnak (2.5 miles). 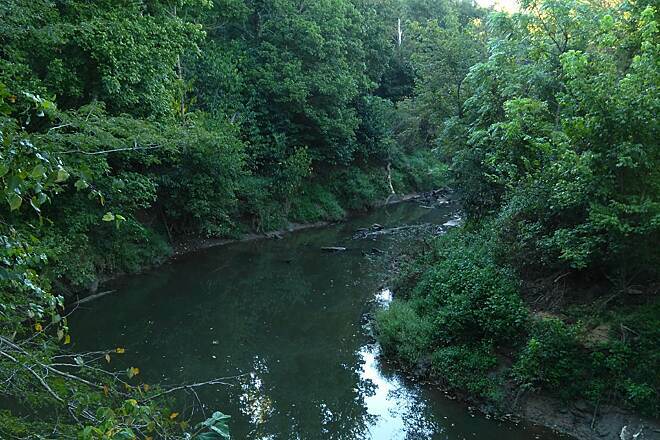 A lot of the south end is shaded woods, with the usual downstate IL mix of steep-sided, creek-bottom ravines-- including a few that are surprisingly deep-- and poison ivy. Overall, there's a slight but noticeable climb from Karnak (340') to Vienna (404'). 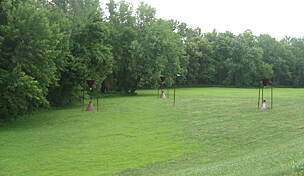 The Vienna trailhead, a town park, is reasonably large for a rural IL town. The station, where you'd think the bathrooms would be, was closed both times we were there. Look for bathrooms instead on the opposite (west) side of the park from the trail, on a slight rise above a picnic pavilion. 216 is an honor system stop that had a variety of refreshments available. Lunch at the Vienna diner was delicious and the overall ride was delightful. My ride started June 10 2016 at 6:38am from Vienna heading north to Eldorado. The trail is well kept, no real rough spots, saw deer almost immediately, saw very interesting spider webs worth stopping to photograph. The tunnel was great, although I didn't use a light I could see where you might want to. 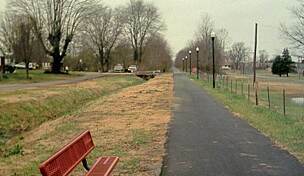 Went through Harrisburg, enjoyed the paved path and rode onto Eldorado, the trail wasn't as well kept but was not bad, as you near town the trail ends and you ride on road for awhile then back to paved trail, at the end it is gravel, I wasn't sure where the end of the trail was but a guy that I had passed showed me where it was. Turned around and headed back to Vienna. Day 2 of my ride started at 5:48 am and headed to the Barkhausen Wetlands, saw more deer and a turkey. My GPS said 112 miles total round trip. I highly recommend this trail, the hills are not bad and not that long. The scenery is great, the trail is mostly tree covered. My only suggestion would be to mark rest areas, towns, creeks and roads, it's nice to know where I am. 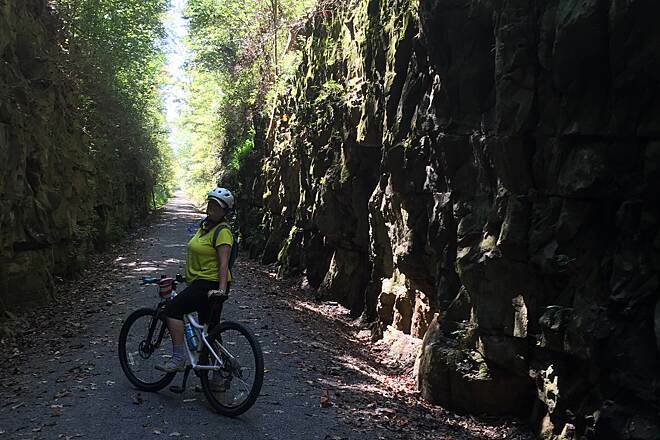 I rode the Tunnel Hill Trail the last weekend of September, 2015. I was a little concerned about how I would do on my road bike and 25mm tires, but the trail was in excellent condition. It had not rained in nearly a month so the trail was bone dry the first day I rode. I started in Harrisburg and was making good time until almost to Tunnel Hill when I got a flat. I quickly replaced the tube and was on my way through the tunnel which was not as long as I'd imagined, although I would recommend a light as you cannot see the walls half-way through. 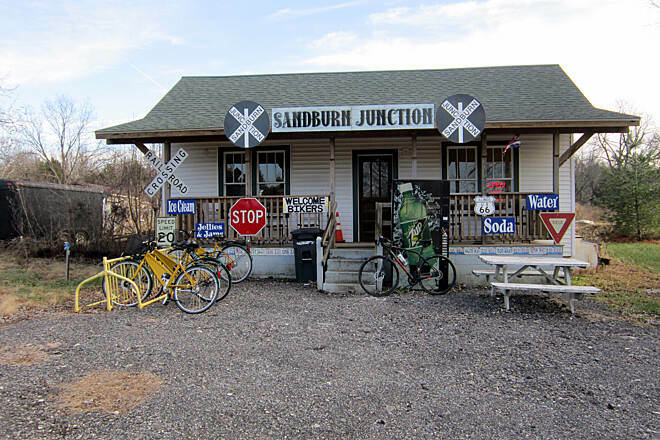 Just after the tunnel, I stopped at Sandburn Junction for a snack (drumstick, yum!) which you pay on the honor system. Not long after leaving the junction, I got my 2nd flat. I managed to patch the tube and was off again. Made it without further incident to Vienna, but noticed my tire had a rip in it. I'd planned on going all the way to the end of the trail at the Cache River Wetlands Center, but due to my troubles I called for my ride to pick me up in Vienna instead. I don't think my tire issues were caused by the trail, but were more due to a worn out tire. I drove to a bike shop in Carbondale and purchased a new tire. The next day, I finished the trail. There had been a light rain overnight which made the trail even better for my skinny tires. Over my two days on the trail I saw about a dozen deer, two turkeys, a rabbit and a zillion squirrels. 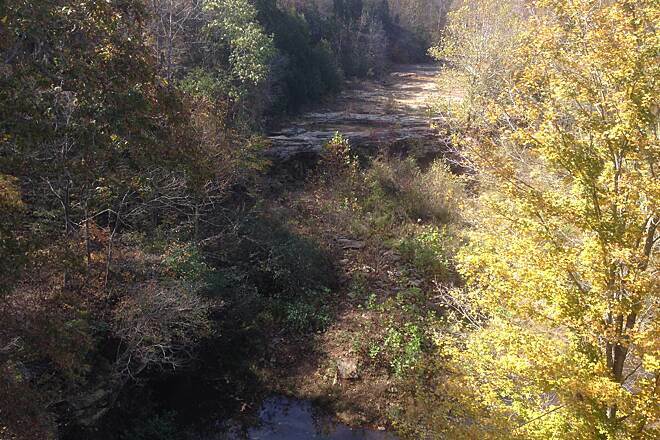 The scenery was full of trees, creeks, rock cliffs, and bridges to keep things interesting. I can't speak to using a road bike during different seasons or under other conditions, but I would not hesitate to do the trail again. Other attractions in the area visited and enjoyed were the Cache River Basin Winery/Wineaux's Restaurant and the Bella Terra Winery. Two other wineries nearby have unfortunately gone out of business. Spent the night in Vienna at Country Schemes B&B and I highly recommend it. Norma makes you feel like family and cooks a great breakfast. Her home is in a gorgeous country setting, decorated beautifully with antiques, the rooms are clean, beds comfortable and the bathroom is stocked with supplies in case you forget anything. My bike ride started in Harrisburg at a small parking lot next to the trail just off of Highway 45. I had never ridden on a rr line converted to a trail, and was very curious how my tri bike would hold hold up on mostly packed, crushed stone. I had been told by a biking buddy to expect a rough, much slower ride compared to the road. There was some concrete in Harrisburg, but it quickly disappeared. The crushed stone was manageable on thin tires. The ride was a bit rough. My goal was to ride 25 miles and then come back to make it a neat 50. Along the way I passed a few walkers, but soon it was just me and the wildlife. 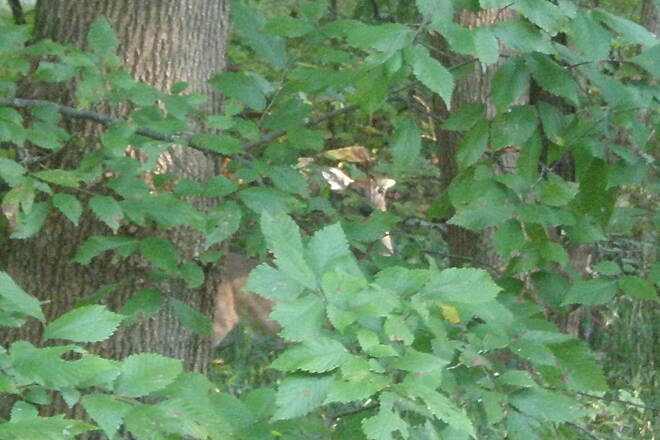 Some large deer walked or ran along the trail ahead of me, and then quickly disappear into the thick woods. 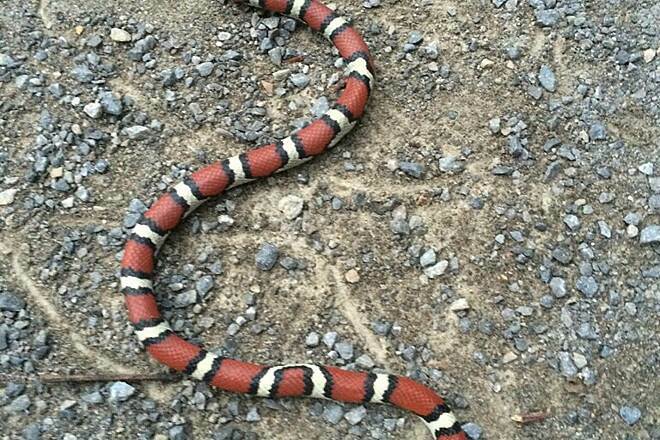 Rabbits, numerous box turtles, and one very long snake crossed the route. The climb to the tunnel is deceptive. It almost looks flat. By the time I reached the tunnel (23.5 m.) my legs were feeling the 2% incline. Big mistake in the tunnel. I did not have a light, and was wearing my sunglasses when I rode in. About a third of the way in I lost all sense of where the walls were. I could see the light at the end, but still crashed up against the side, taking skin off several knuckles, but protecting my bike. I walked the rest of the way out. Felt pretty stupid, but quite an unusual experience. Only real complaint, on the way back to Harrisburg I stopped at 3 water fountains to refresh my bottles. None of them worked. Finished the 50 m. in about 3:30. Much faster leaving the tunnel, almost all downhill, but speed overall averaged 13-15 mph. Once I reached concrete, it was like ice, so much faster than the stone. Great scenery, quiet, and a good workout. Tunnel hill has great views, fun bridges and cool tunnels. Most definitely worth the 2 hour drive from St Louis. We took our road bikes and the ride was fine. You won't be going 18 mph more like 12-14 but it's very doable on a road bike. This trail is so well maintained we road 30 miles on 25 mm tires. The tunnel was kind of a dissapointment due to what we heard and reviews we read... Don't get me wrong... the tunnel was great BUT, We were expecting more... We ripped through it FAST. We were expecting this to be similar to the KATY TRAIL, but rather than loose gravel, we found it to be a smooth, less friction ride. We drove about 300 miles to ride this trail and were not disappointed. We rode the section from Barkhausen Wetlands Center to the tunnel the first day and the section from New Burnside to the tunnel the second day. 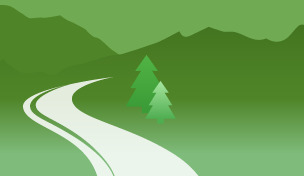 The trail has a lot to offer and is well-maintained. The section from Vienna to the tunnel seemed to have the most use and was also in the best shape. In that section the crushed rock (screenings) was well-packed and great to ride on. South of Vienna and north of the tunnel the surface was looser and grabbed our 28c tires a few times. 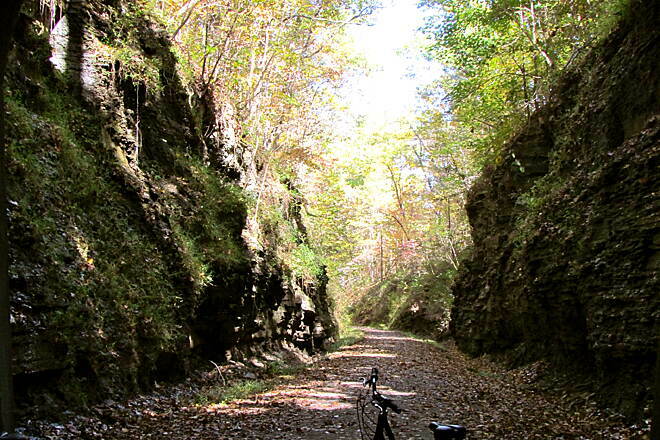 There are plenty of bluffs, ravines, and water to keep a photographer busy. 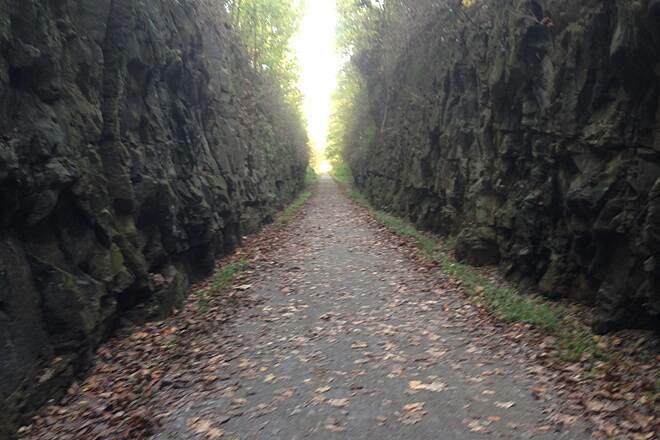 Being a rails trail, it is pretty much flat. But you do have some elevation changes. The high point is the tunnel-- literally and figuratively. 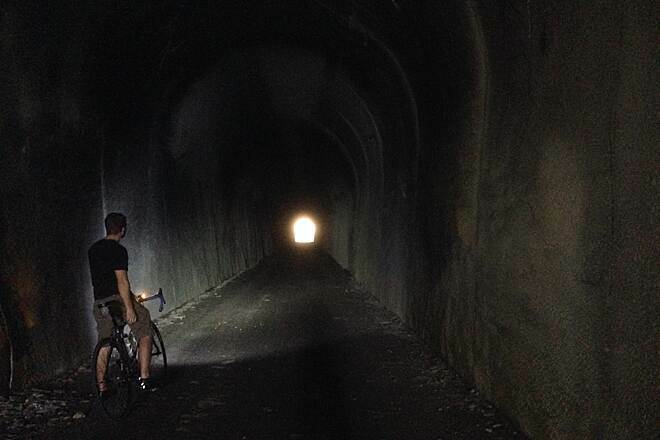 Riding through the tunnel was eerie. Not dangerous, but weird. You can always see the light at the end, but once you get in to the darkness, you can feel yourself moving, but don't seem to be getting any closer to the end. It was odd the first day and even cooler the second day when the high humidity caused a fog inside! 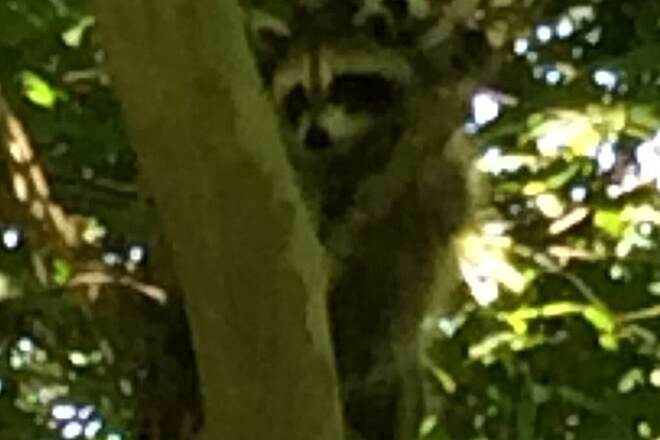 We saw deer, two young raccoons, a toad hopped across in front of us, some turtles sunning on logs in the water below on one of our trestle crossings, horses, heard a cow, goats, and a half dozen turkeys tried to blockade the trail and yelled at us as we went past. All in all, a great trail! nice quiet and slow pace,... nice! 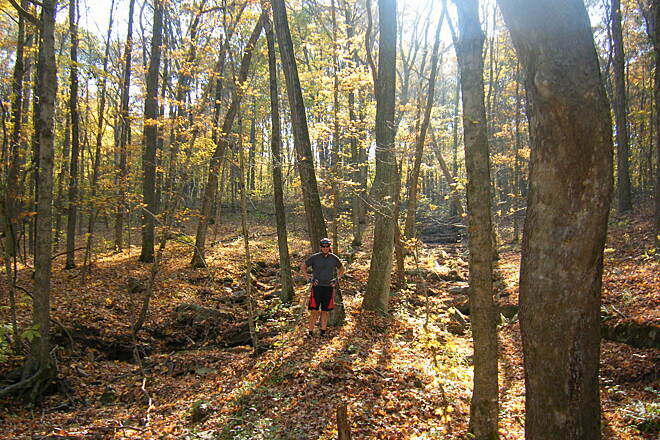 Did the north half of the trail in 2012 and just completed S half (Stonefort-Karnak) 10/29/13. It rained but not enough to soften the trail. This is a nicely compacted trail without grass which you see on other trails with similar history. Tunnel was shorter than I expected---light not needed. Rode the trail on Aug 17 & 18. The packed limestone did not give me any trouble with my 700 x 35 size tires. First time I've rode a trail. The wetlands center is worth the ride and watch the 12 minute video/movie they have there. I thought there would be more riders, but on the 18th (a Sunday) we rode from Harrisburg to the tunnel and halfway back and met less than 15 bikers/runners. I was hoping to find a shop that would have a Tunnel Hill State Trail t-shirt, but no luck. At the wetlands center you can get a tunnel hill patch for $4. My only complaint about the trail was the street crossing approaching the trail head in New Burnside where I almost crashed due to a deep rut at the transition from the asphalt to the crushed stone. Also, a good light is advised for the tunnel, my "Spock" was worthless. All in all, a great ride and I will definitely be back. We rode this trail late May and split it up into 2 days. The first day we rode from Karnap to the tunnel, back to the Barkhausen Wetlands Center and then back to Karnap. 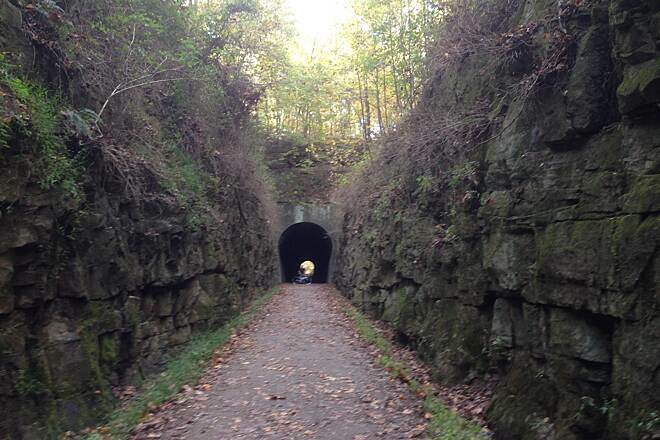 The following day we rode from Harrisburg to the tunnel and back. The trail is tree lined which provided shade and blocked the 20+ mph winds. The trail is also flanked with honeysuckle that was in bloom which made for a very fragrant ride. The Barkhausen Wetlands Center was closed so we were unable to park and start from there. This a beautiful trail. There are rest stops every 7 or 8 miles with water and there are multiple places to eat along the way. The section from Stonefort south to the wetlands center is probably the prettiest but the portion from Stonefort to Harrisburg is also scenic. I stayed at the Limited Inn in Vienna. The room was clean, comfortable, and reasonably priced. 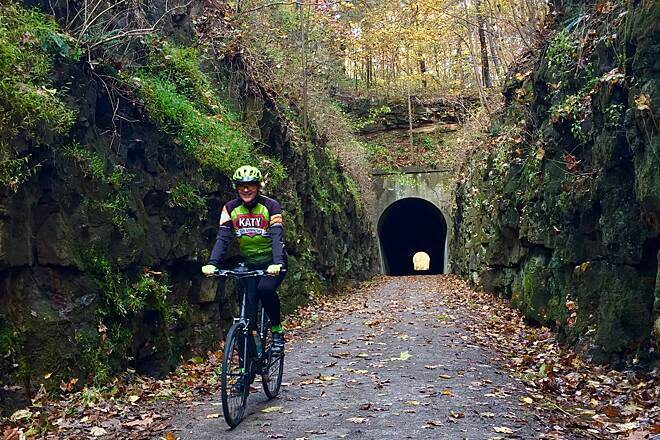 I’ve ridden a lot of rails-to-trails and the only one I enjoyed more than Tunnel Hill was the Mickelson Trail in South Dakota but that is tough competition. Great ride! The Harrisburg to New Burnside leg of this trail is pretty flat and not that scenic, but the rest of the trail is great. When you hit the tunnel don't be fooled, that's a fairly long tunnel and about 1/3 of the way in you're in the dark! The exit is the only light you have and at that point you get this optical illusion that its moving from side to side. I stopped on the other side and snapped a few pics and had a brief chat with a guy who scraped the side wall and almost wiped out. I'll be bringing a headlamp with me next time I ride this trail. 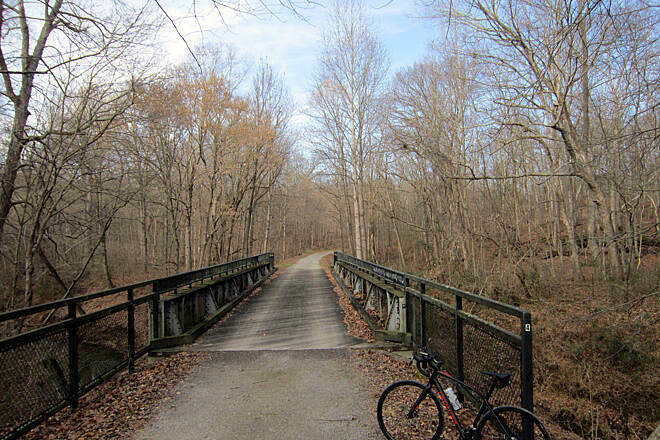 The bridges and wooded area you ride through are an added bonus. I'll be hitting this trail again soon. Next time I'm going to start at the southern end and turn around at Stoneboro. Nothing much to see after that point. 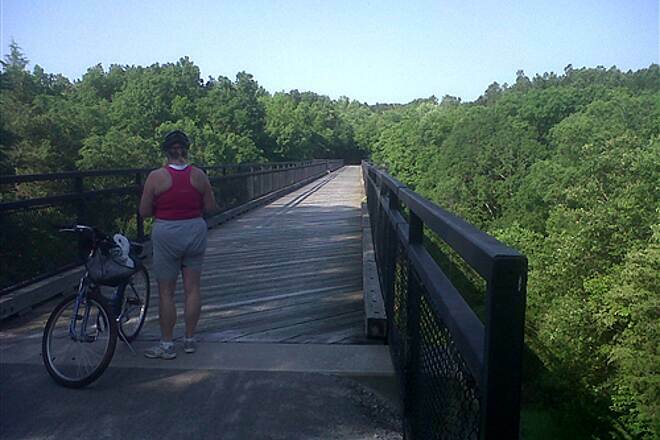 A friend and I rode this trail in July, 2012. We decided to ride 34 miles from Harrisburg to Vienna. I was really impressed with the trail! There were mile markers all along the way and dedicated rest stops built just for the trail! The trail is mostly wooded and therefore in the hot summer you will ride mostly in the shade. The trail was very well maintained. There were a couple spots that had recently been maintenanced and the rock there was a bit loose, but it was nice to see the trail given a good amount of attention. I don't recommend narrow racing tires because of the loose rock in spots, but mostly the trail is hard packed crushed rock and is very enjoyable to ride on. 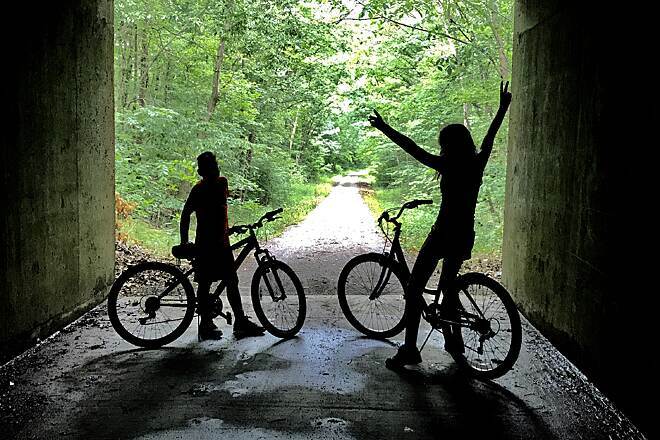 We rode on hybrid bikes and they were perfect for this trail. There was a 2% grade incline for us because we were going from the North to the South. You can avoid the incline by taking this trail from the South going North which will give you a decent of 2% instead. Still, the incline was not bad at all. There are decent privy toilets along the way, however the water fountains have been vandalized and are not currently working. Bring plenty of water. The General store in Stonefort was a nice place to stop for a sandwich and cold drinks. I'd recommend a light when going through the tunnel. The views on this trail are absolutely beautiful! The best views are from the tunnel to the Southern part of the route. One word of caution...you may wish to bring some sort of animal pepper spray. We sighted a cougar on the trail!!! Fortunately, it wanted nothing to do with us. We must have looked intimidating on bikes. Also watch for rattlesnakes and copperhead snakes. Both are indigenous to this region and they are poisonous. We did not see any on this trip, but we've talked with others who have spotted them. Stay far away if you see them. No need to think you are safe while up on your bike!There are a few places you can rent very nice bikes if you don't wish to hassle with hauling your own bikes. Harrisburg has a shop, "You're So Vane" which has a website. He will also pick up your bikes and/or you for a fee if you wish to just take the trail one way. There's also another small bike place near the tunnel at Tunnel Hill. It's the old post office and depot. They also do pick-up service for a fee. I've been told there are at least one or two other places to rent bikes on this trail. 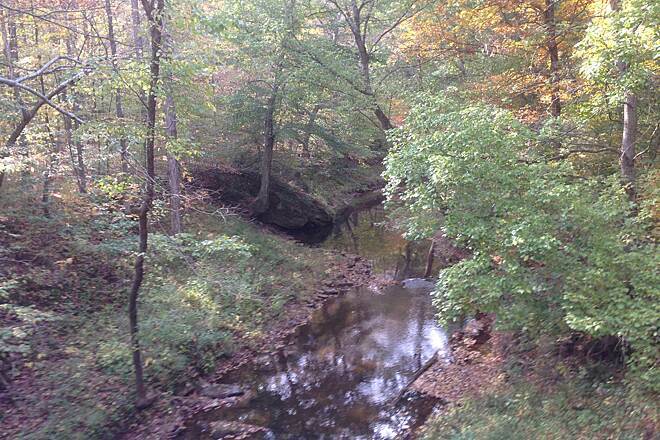 There are many places to camp/lodge and of course the Shawnee wine trail is around the area! 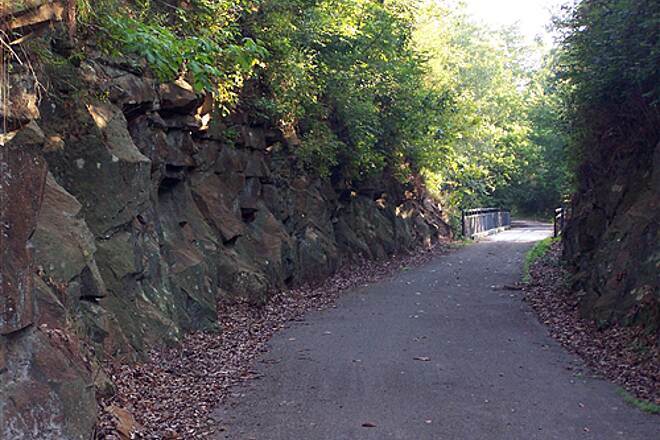 We love the Shawnee area and we love this trail! 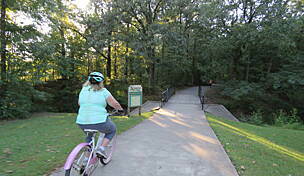 I rode this trail on Thursday and Friday, Sept. 8 & 9th beginning the wetlands center in Cypress. I rode it to Stonefort. It was a gradual easy climb to the tunnel. 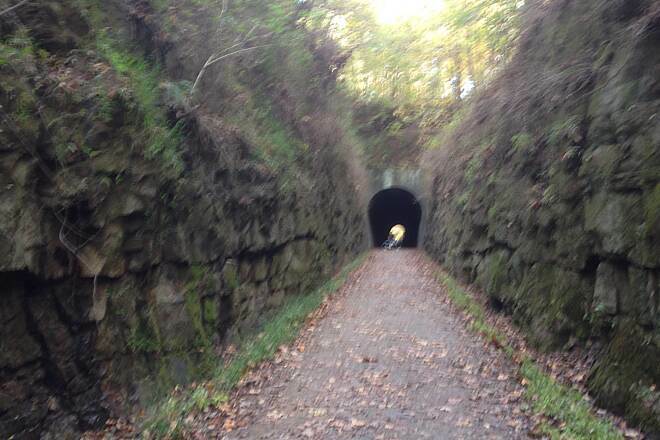 The tunnel wasn't that impressive when compared to the many significant tunnels on trails around the country. The hard packed surface was almost as good as asphalt. In Stonefort, there was a store and cafe that advertized on a board out front that they had a bologna salad sandwich. I had eaten lunch, but I just had to try one. It was pretty good for bologna. The next day I rode from Harrisburg back to Stonefort. The trail was in good condition, plenty of mileage, t a variety of scenery, nice small communities, and good camping in the area. I hate that I did not take time to checkout the "ghost town" mentioned in the guidebook. 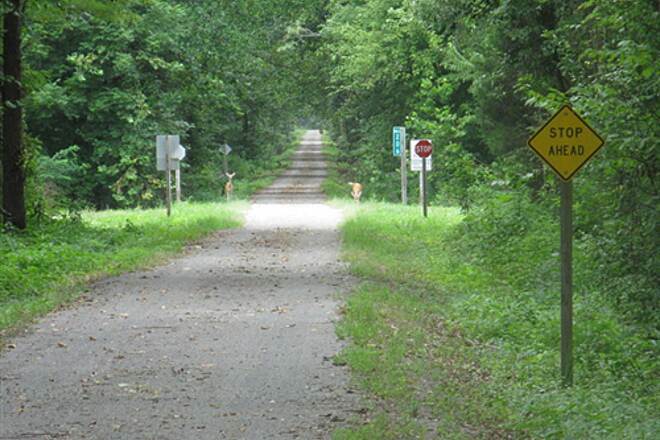 This was my first trail in Illinois and making it my 33rd state in which I have ridden a trail. My wife and I drove from Georgia to do the trail over Memorial Day week and loved every inch of it! We started in the southern wetlands and enjoyed the relative easy climb to the tunnel and down again further north. Encountering several deer,rabbits,squirrel and even two copperhead snakes made this a memorable trip. We have hybrid bikes and it was a good thing because certain areas would be really challenging for skinny road tires. Still a great ride! There are good facilities at Karnak,not Belknap. 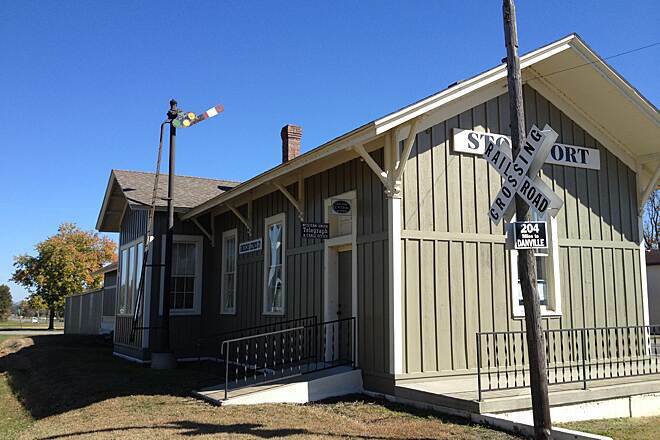 Vienna is the headquarters for the trail and you have ample room for parking and even the old Forman Depot serves as a museum/gift shop for the trail. Good picnic area also.Trail climbs from here to the tunnel and descends all the way to Harrisburg. There are some nice bluffs between the tunnel and New Burnsides worth taking in. This spring the trail was finally completed when Burlington Northern Railway granted permission for a crossing at Foreman. This means that riders will no longer have to detour into the traffic on Belknap Road. The trail has been deluged with 13+ in. 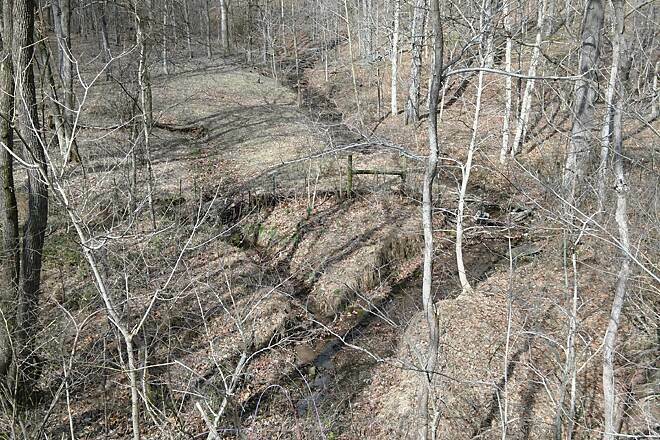 of rain in the last week and the trail going south from Vienna is currently (05/03/2011) roped off so I imagine there is considerable water damage. 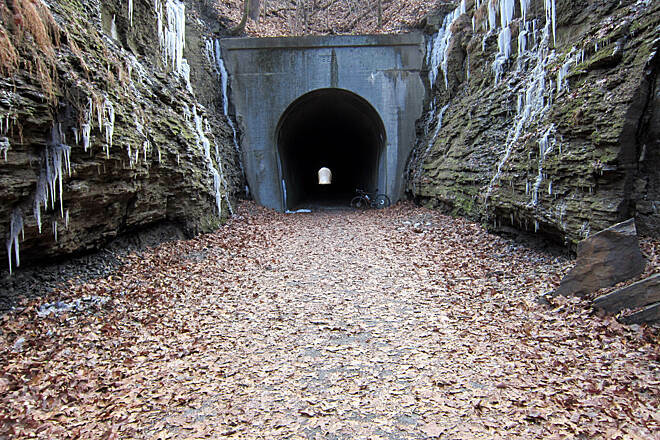 I have ridden the trail since its opening and would suggest novice riders wanting an easy, scenic ride to depart from the trailhead at Tunnel Hill and ride South to Vienna. 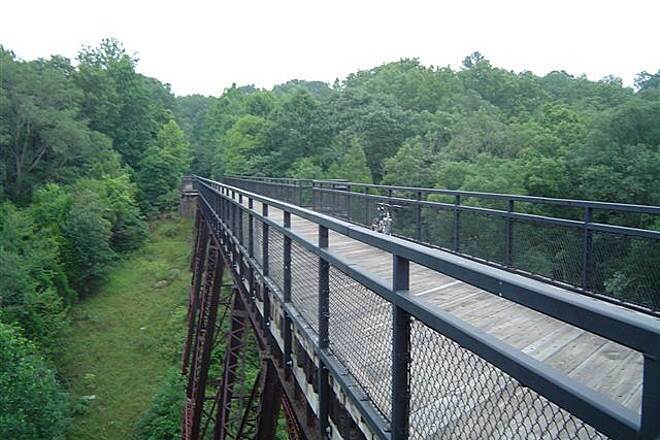 This stretch of the trail contains the tunnel and the 90 feet high Breeden Trestle as well as numerous smaller trestles and streams. More importantly for the novice rider, the trail has a gentle downward slope into Vienna which makes for an easy ride of about nine and a half miles. Also, I read in one of the reviews that restrooms and water are available in Belknap. There are no services there but 3 mi. farther Southwest in Karnak you will find water, restrooms as well as a restaurant and store open on Monday thru Saturday. They also have vending machines available 24 hrs. The trail from Karnak to the Henry Barkhausen Nature Center is always open but access to and from the parking lot to Route 37 is closed with a gate when the center is closed. My girlfriend and I rode the whole trail, both directions, in one day. For those considering this, the crushed stone surface doesn't roll as easily as pavement, so it takes a bit more effort. Also, if starting from the SW end, you'll want to park at Karnak, as the wetlands center parking lot is only open during their business hours. I've ridden trail surfaces like this on 23mm tires, but, wouldn't recommend it. Being crushed stone, applied via a spreader, results in some variation of depth and compaction. There are plenty of soft areas that could easily cause a novice on narrow tires to crash. I changed her tires to 28mm sizing, to ensure her enjoyment. I took my cyclocross bike on 32mm tires. If one plans to go through the tunnel, they should take some kind of light source, whether it be a flashlight or headlight. The tunnel is very disorienting, even though it is straight. If one only has time to ride part of the trail, I'd recommend any of the areas SW of New Burnside. Further NE of there: the trail is less secluded and exposed to traffic noise from RT45, the trail isn't maintained quite as well, we encountered an area where someone had been riding their horses on the trail and caused damage, and we had someone in their pickup truck come flying down the trail, just outside Harrisburg. The scenery is just incredible. There is a large variety of wildlife to view, especially deer and butterflies. 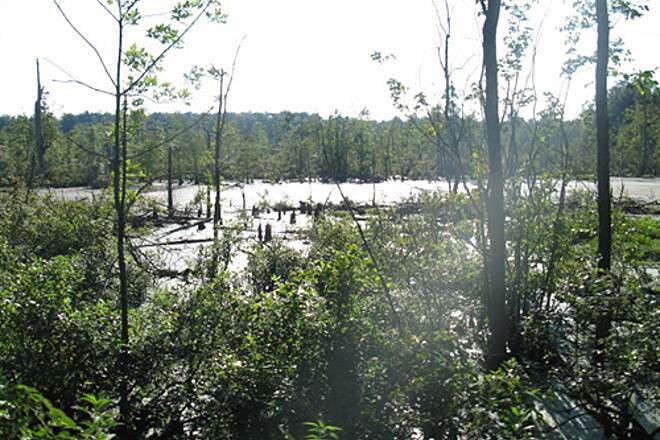 Be sure to see Heron Pond, though you'll want to creap up on it so as to not scare them off. The Tunnel Hill Trail is very peaceful and relaxing. 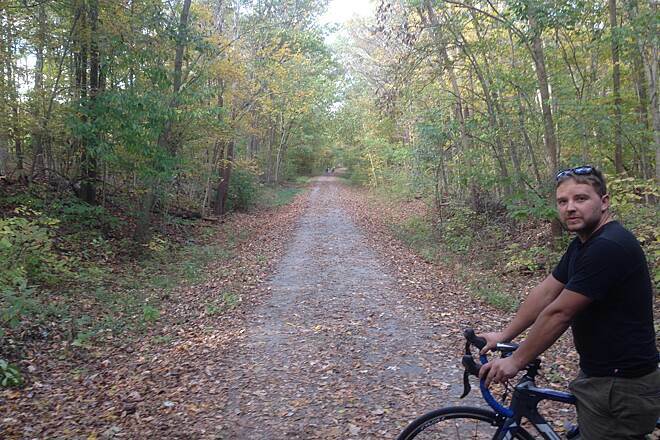 If there's a better cycling trail in IL, I haven't yet seen it. This was our first time on the trail. We rode from Harrisburg to Vienna. The trail was shaded almost all of the way. We had lunch at Dolly's in Vienna. The next time we may start in Carrier Mills and ride to Vienna as the Harrisburg to Vienna was a touch long. It would a beautiful trail in the fall and we plan to go back. Just a caution the tunnel can be a little confusing. 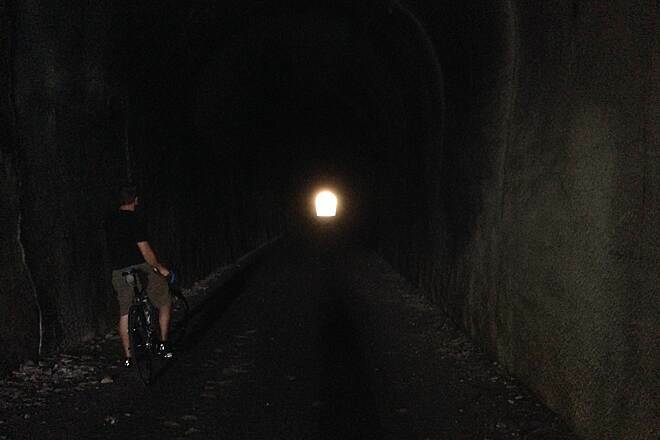 The darkness is disorienting even though you can see the light at the end of the tunnel. A flash light would not be a bad idea. 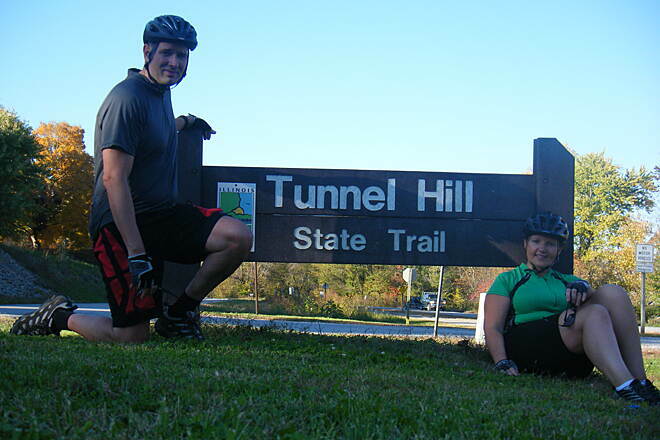 My wife and I were returning from a biking trip on Wisconsin Rail Trails and decided to stop in Vienna to do the Tunnel Hill Trail. I had read about the trail in the RTC magazine. The trail was beautiful and well groomed. Along the twenty miles of the trail we did, there were numerous high trestles over small streams and the stunning tunnel. I can only imagine how wonderful the trail will be during the fall foliage time. This is definitely a trail worth traveling to for a wonderful ride. 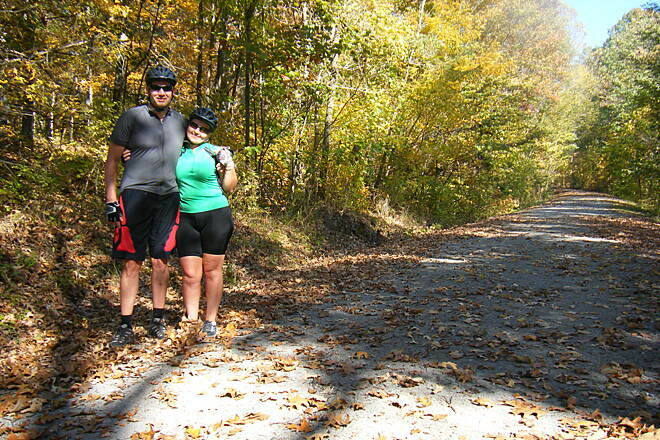 "My wife and I rode this trail on June 24 from Vienna to Tunnel Hill on our recumbents. 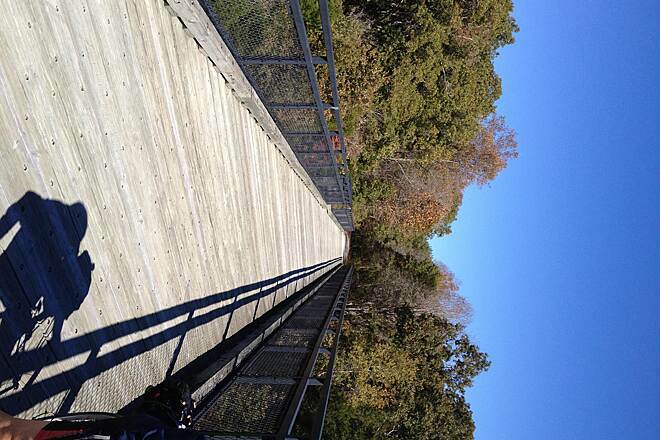 It is a beautiful, quiet and well maintained trail with very few road crossings. For most of this ride we were in the shade because of the huge trees along the trail. We also rode the next day, starting at Karnak and going north a short distance; there had been a big rain the night before, but the trail surface was very good in spite of that. Road bikes or recumbents will have no problem on this surface." "From farmlands to forest to rocky hills and finally to the Cache River swamp & wetlands. Enjoyed the whole 47 miles last summer. I'd wish they'd extend it further. My friends who didn't bring bikes got to rent from a compnay in Vienna, Illinois, Peddles & Paddles. Very nice people and we paid for the ride up to Harrisburg and rode south on our bikes. I highly recommend this company for folks visiting from out of town. P. Murrell Gresham, Oregon." I live in Evansville IN and have been over to this trail 4 times. The first time I was just getting back into riding so I did not have the stamina. But it really didn't matter cause the trail is so nice. The next couple of times we rode from Tunnel Hill to Karnak. All I can say it is a beautiful trail worth the time to check out. My next goal is to ride the whole thing. I have ridden on this trail for several years and watched each new section being developed. 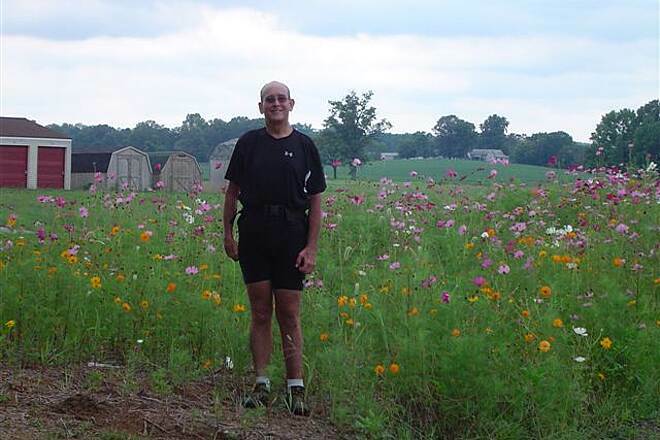 I have cycled the Vienna to Harrisburg round trip once and shorter distances several times. 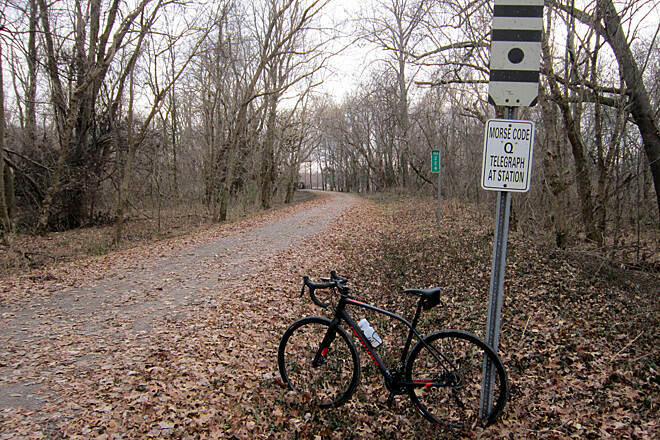 This trail is good for long endurance rides or short group or family rides. The trail in the fall is spectacular. I have seen several deer along the way too. Don't miss an opportunity to experience this unique park. 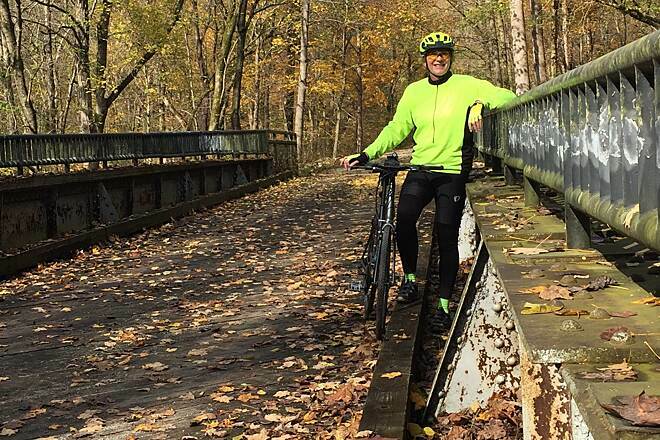 "I needed a new place to take my daughter for a training ride where we could get 50 miles in. 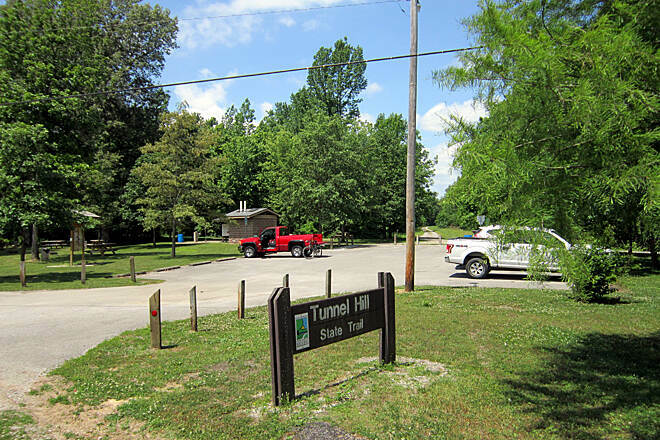 So, we opted to head up from Tennessee to Southern Illinois and give Tunnel Hill a try. Wow, what a pleasant surprise!! 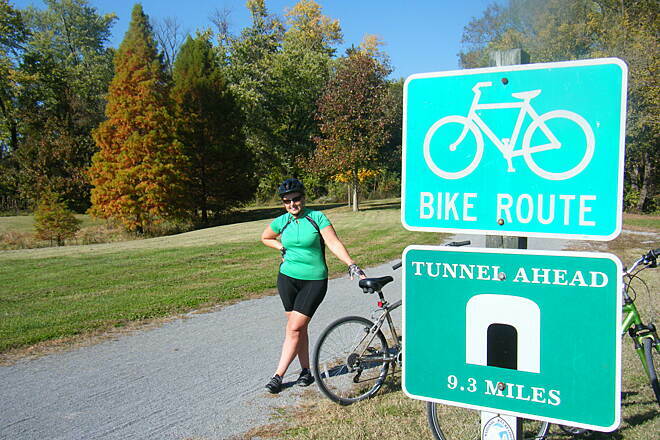 I have ridden the length of the Katy Trail, and have also ridden in the Smokey Mountains. Tunnel Hill, by far, has the most diverse scenery of any place I have ridden. And to think that it was all compacted into a 45 mile strip. 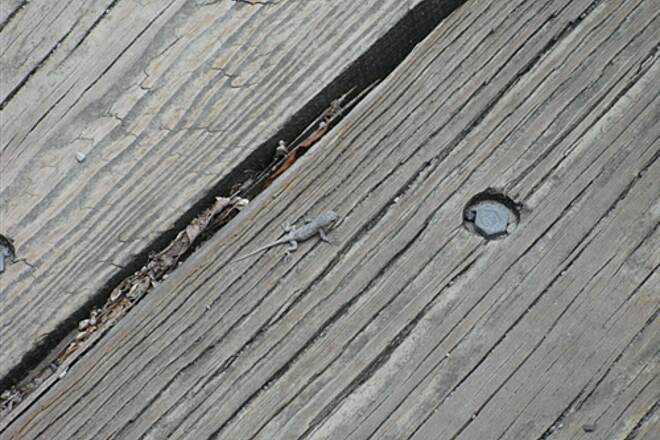 The wildlife was abundant and equally as diverse. The trail was very well kept although the trail construction near Belknap is not complete. The 3/4 mile detour wasn't bad, but some of the traffic wasn't bicyle friendly. The trail was very well kept and taken care of. 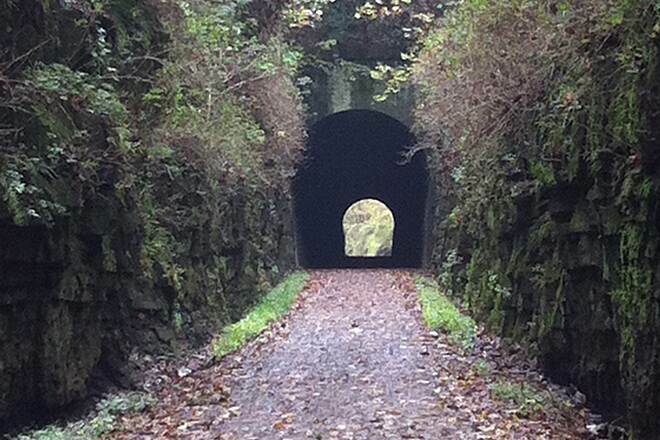 The 'Tunnel,' as my daughter put it, was like watching the movie the ""Shining."" As you approached the entrance to the tunnel the exit kept moving further and further away. Once your into the Tunnel you think your visibility is going to be okay then all of a sudden everything turns dark around you. You will need to stay focused on the light at the other end because you can not see the walls, the ground, etc. My daughter hit the wall..She was going straight then all of a sudden lost her bearing and took a 20 degree turn. Anyway, the tunnel was fun so we went through a few times. My only regret is that we did not stop and explore around the Cache River Wetland center. I think we may take another trip and see what we missed." 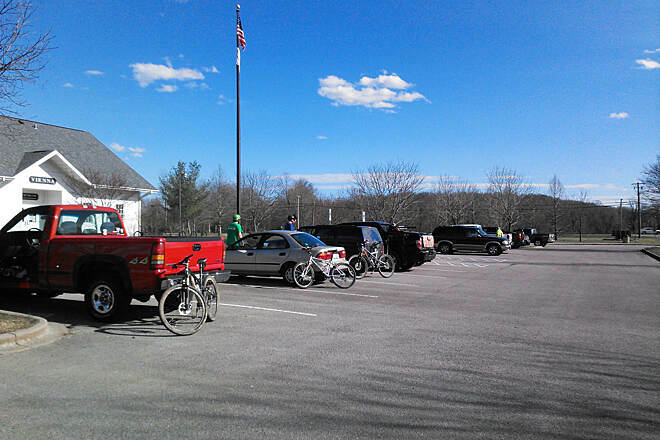 "I rode with a group of guys this past weekend on a round trip from Vienna to Harrisburg (about 68 miles). Most of us had road bikes with 25-32 mm tires. We all remarked that the folks that constructed this trail and keep it up get an ""A+"". The roadway is packed very smooth and has no chuck holes. There is virtually no debris on the trail. The bridge decking was installed with diagonal boards for a smooth ride and there is no bounce in transition at the ends of the bridges. There are restrooms and drinking fountains in the closely spaced towns along the ride. The trail managers have done a super job. The views along the trail are great. Much of the ride is through a forest. Highlights were the tunnel and the high trestle bridge just south of the tunnel. We were disoriented by the pitch darkness in the tunnel and walked its middle third. Although you can clearly see the end of the tunnel, you can't judge your distance from the walls. The rangers told us that riders frequently run into the walls. 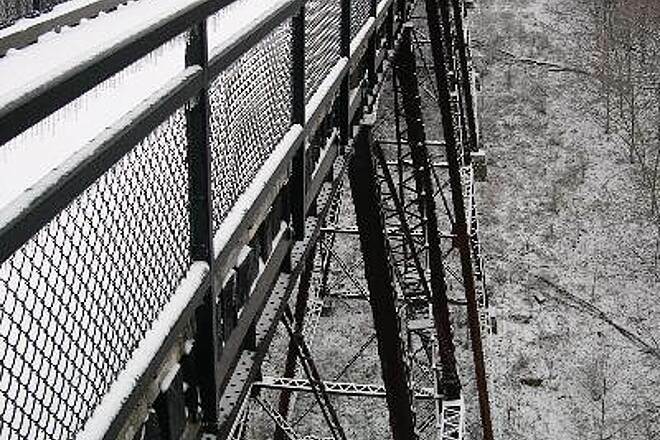 On the bridge, there are balconies on the side so you can see the view better and it also allows you to look under the bridge to see its old iron superstructure. This is a great destination ride. In Vienna, stay at the Limited and go to dinner at the pub on the NW side of town called Big Boys for a steak, beer & great service. Big Boys isn't in the Yellow Pages, so you'll have to ask for directions. This is the most scenic trail I have found in Illinois. My late February ride treated me to some beautiful icicles along the cliffs. One improvement that is needed is a paved shoulder on Illinois 146 in Vienna. 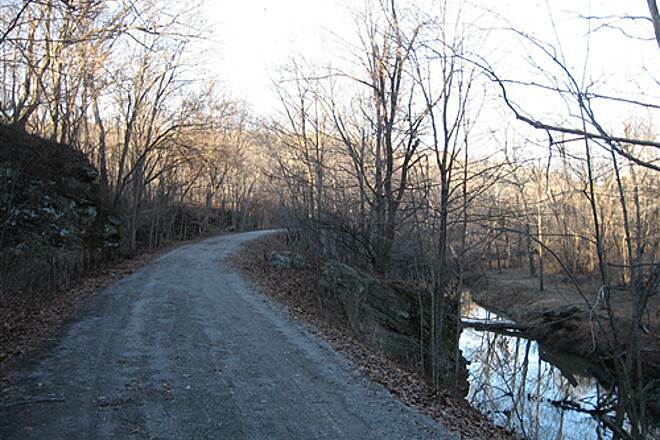 Illinois 146 is a heavily traveled (7700 vehicles a day) 26 feet wide 2 lane road and is the only access point to the trail in Vienna. 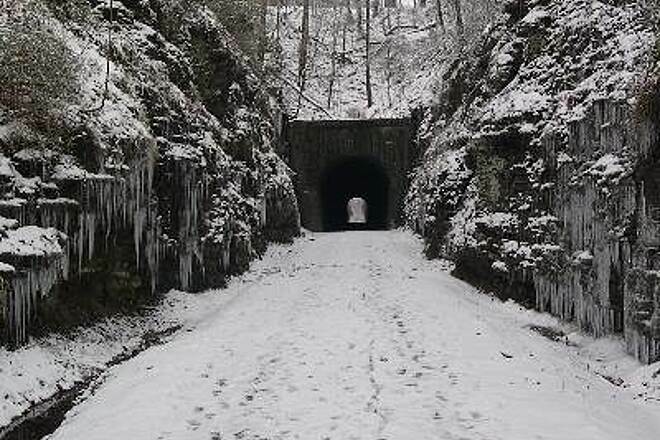 "First of all, complete disclosure: I am the co director of the Tunnel Hill 10 mile trail race held in November so I have a vested interest in this trail. However, one of the reasons I volunteer for that job is the same reason that I am writing this review. 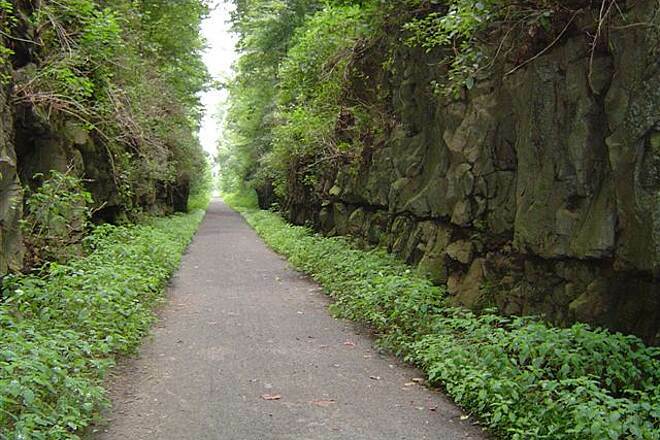 The Tunnel Hill trail is the most wonderful running trail I have ever been on and it is very good for biking too. It is my home training course for both marathons and I have done much biking on it getting ready for long triathlons. I have taken triathlon bikes and road bikes as well as mt bikes. Anything works, but if on a skinny tire bike, stay away from the edges. 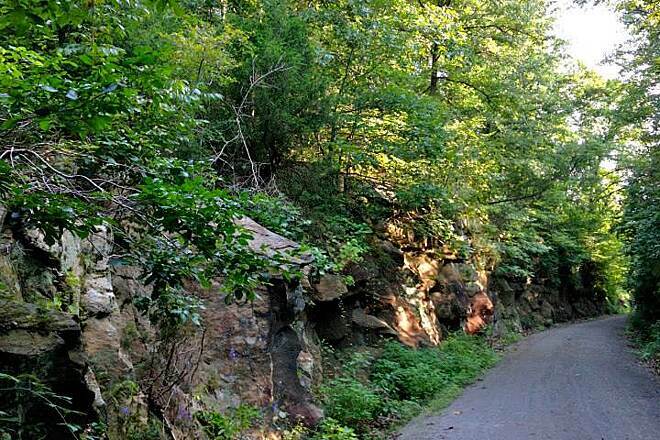 The best part of the trail is the 9.3 miles between Vienna and Tunnel Hill. You have about 2 1/2 of up hill as you get into Tunnel hill coming from the south. That is the reason for the train tunnel in the first place. You can then turn around and zoom back to Vienna. If the trail is wet it really hard packs well and you can really move back to Vienna. It can be ridden in the 20 mph range if you can spin that fast. DO NOT WEAR SUNGLASSES IN THE TUNNEL. IF you do you will lose your way and find yourself on the ground. 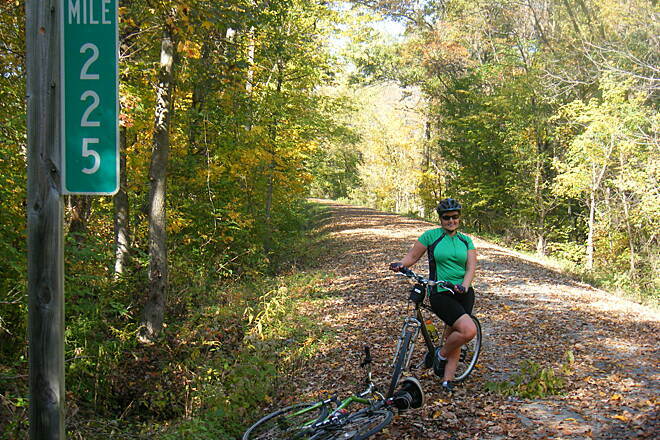 "I rode the lower 2/3 of the trail in May 2005 and found it to be quintessential Southern Illinois. The surface is a course sand that packs very well. Road bikes will have no problems. Take the usual repair stuff though, help can be a long ways away. An outstanding ride. " My wife and I rode this trail twice (out & back) over a three day period. We have ridden many trails in many states and I must say this is one of the top 5. 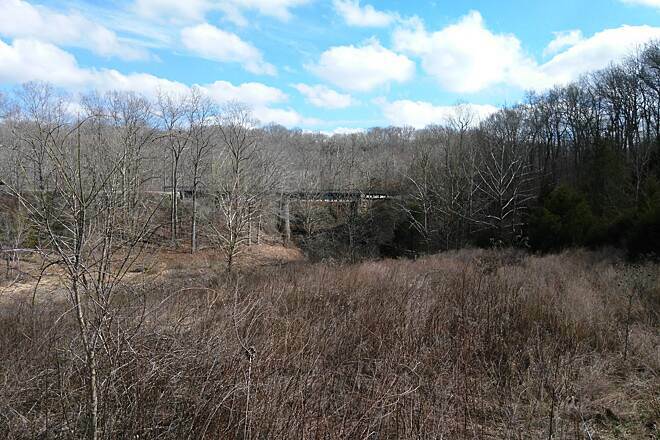 The mostly rural route was scenic and there were numerous railroad trestles of impressive length and highth. We really enjoyed the trail and scenery but the best part was the family at the Morris Acres B&B. They were fantastic and took us to the end of the trail to start our ride. "The ride was fantastic. 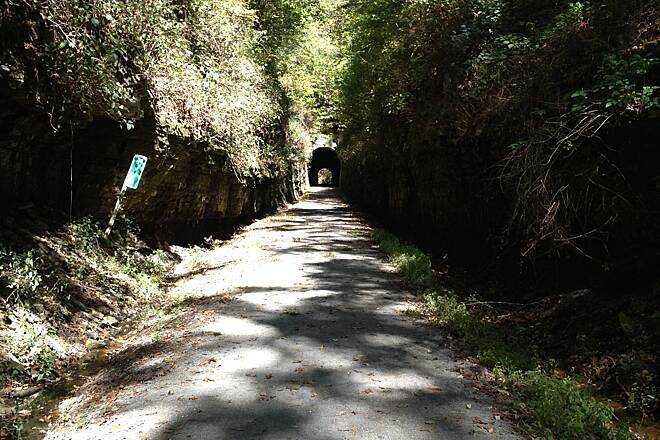 It is one of the most scenic rail trails I have been on in the past few years. Despite getting drenched a few times, we thoroughly enjoyed biking the leg of Tunnel Hill from Vienna to New Burnside and back. We hope to do another portion another time. And our hostess at the Country Schemes B&B in Vienna was most delightful. " 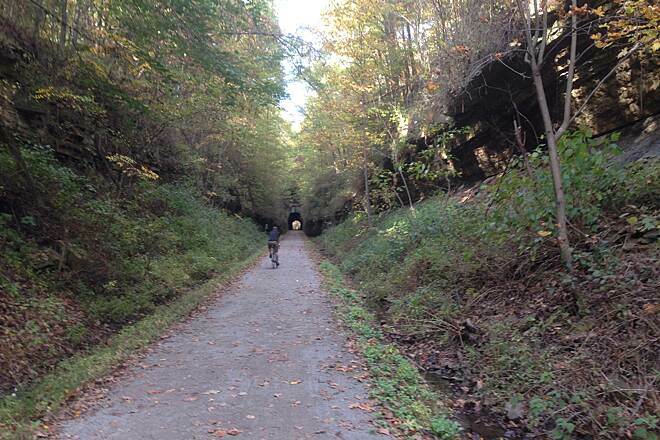 Tunnel Hill State Trail is by far the best trail I've ridden in Illinois. 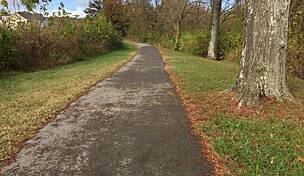 The trail is second only to the Katy Trail in Missouri. "The section between Harrisburg and Tunnel Hill runs alongside State Hwy 45 and is fairly non-descript and noisy from traffic. The most picturesque section of the Tunnel Hill Trail is between Tunnel Hill and Karnak and in the fall is absolutely gorgeous and serene! 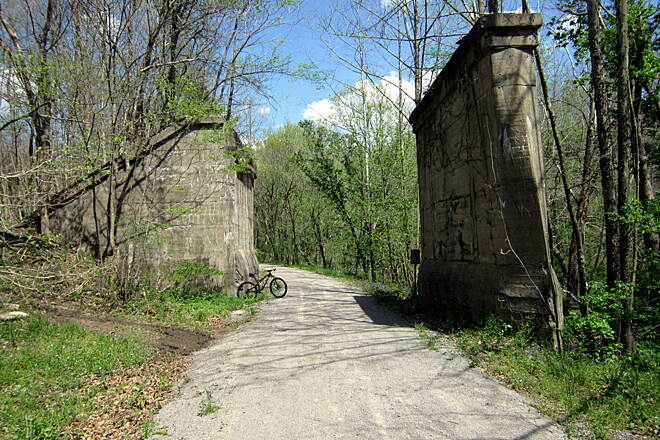 The Trail Head is located in Vienna (pronounced veye-anna). 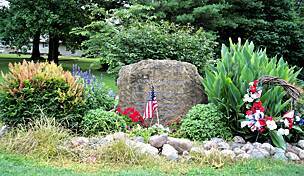 It is located a couple of blocks East of State 45 on State 146. Going South to Karnak the trail transverses into wetlands terminating at the Wildlife Center in Karnak. The literature describes this center but unfortunately the state ran out of money and as of Spring 2002 the center was not completed. There is also a short 1 mile section of the trail that is closed and you go off trail onto public roads. 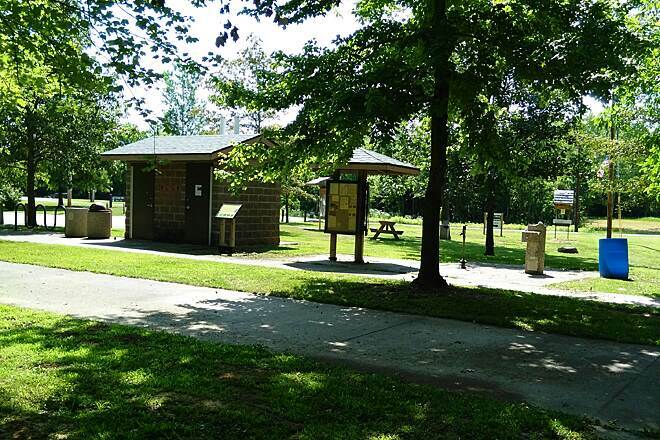 At Belknap, there is a small on trail facility with restrooms and water. My favorite section of the trail is between Vienna and Tunnel Hill. The trail follows a stream for much of the ride and is well removed from any roads making the trip very quiet. 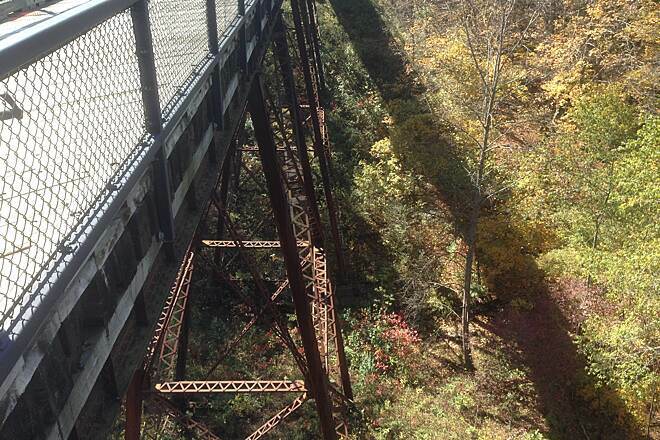 Several trestles cross the stream along this route with very picturesque views. 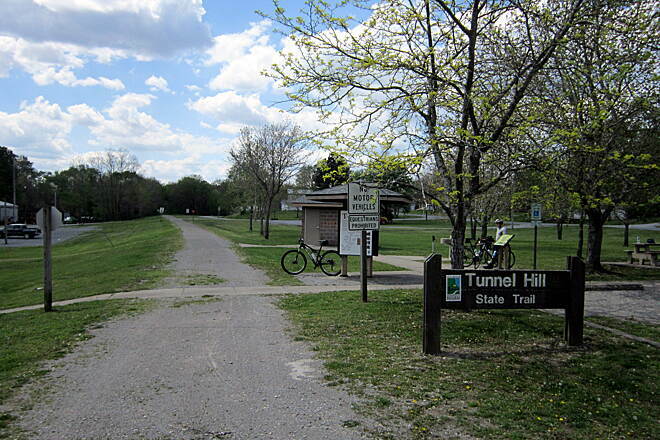 At Tunnel Hill, there is a small parking area with restrooms and a water fountain. The tunnel itself is only a few hundred yards South of the parking area. Wildlife: On various rides I've seen Wild Turkeys (hens), White Tail Deer, Red Tailed Hawks, a Golden Eagle, Fox and a variety of varmints! Terrain: The lowest points of the trail are in Harrisburg and Karnak, which means that the trail rises to Tunnel Hill, the highest point. There are no hills to speak of; instead the trail is a gradual up grade the entire distance when going towards Tunnel Hill. Riders looking for a no exertion ride should consider going from Tunnel Hill to Karnak. 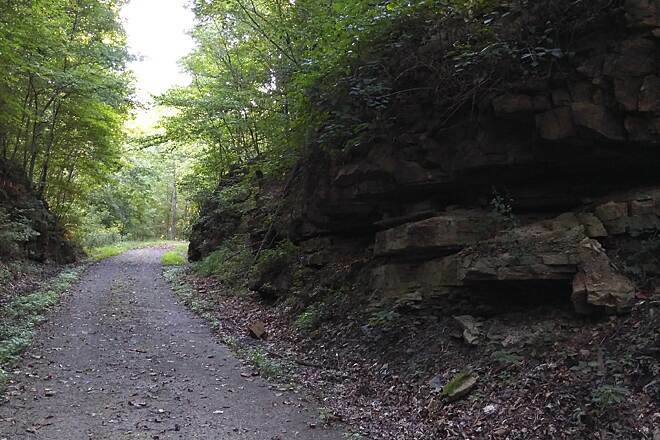 The trail is composed of crushed limestone, which is in good shape for most of the trail. There are some soft edges in places so you may want to avoid hugging one side or the other. The only exception to this I found going into the Nature Center at Karnak. There is a short section leading right up to the building (maybe 400') that was really soft. It is in a wetland area after all! I've ridden the entire trail with 28mm tires on a road bike with no problems. Amenities: There are numerous places to eat in Harrisburg and Vienna but that is about it. I haven't been able to find anyone offering shuttle services between the major points so if you want to ride the entire trail, plan on doing it again on the way back." 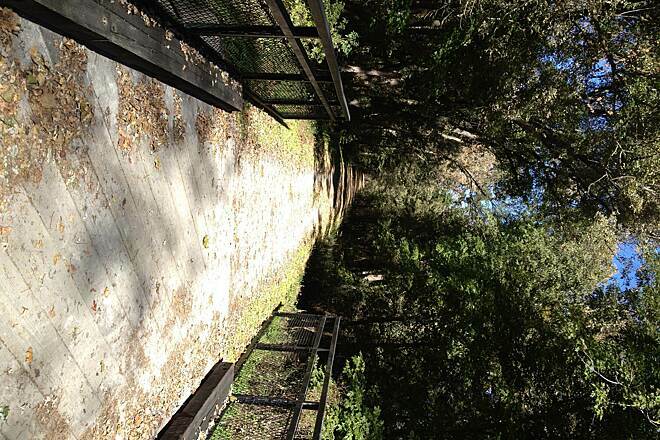 Newer listing for this trail exists!!! 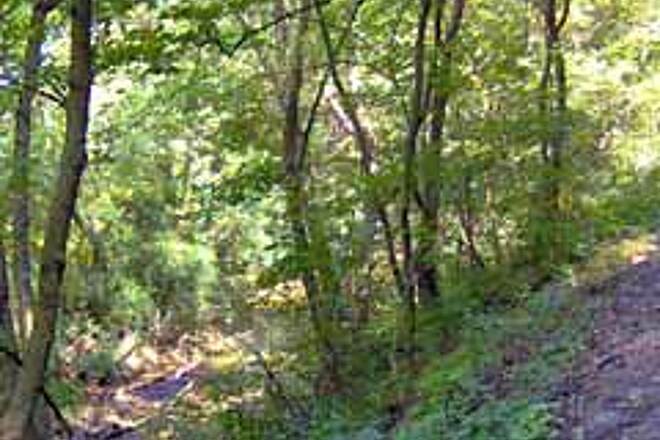 "I have just added a new listing for this trail that gives more detailed information and website links. 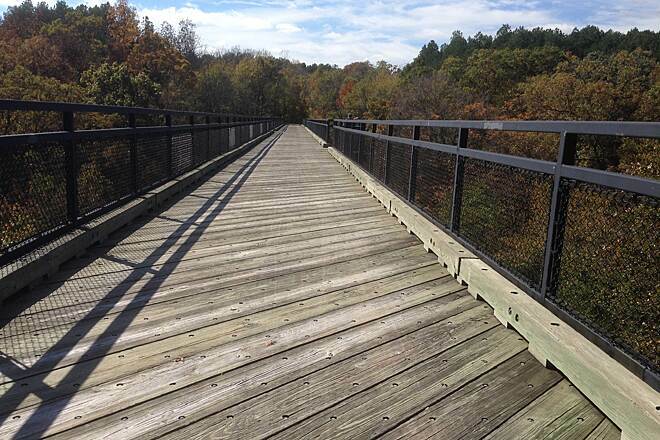 The trail has 45 miles of rail-trail open, through beautiful hardwood forest, and is awaiting your visit." Update your records! 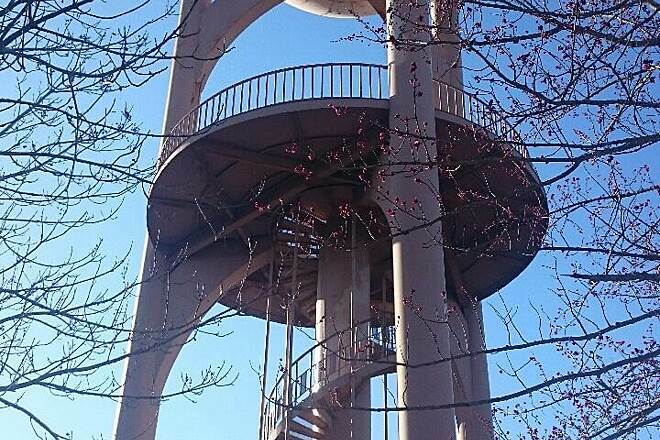 I was on the trail 4/01 and it goes all the way to Vienna and will soon be open further south. Vienns has a nice trailhead in a park with a rail museum too. What the trail is really like!!! 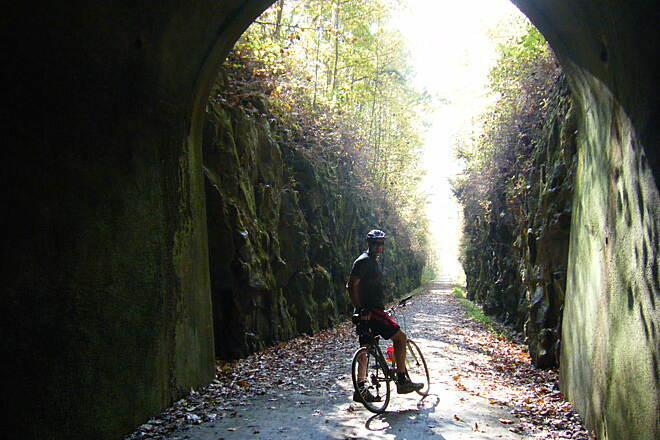 "The Tunnel Hill Trail is a crushed limestone rail trail with beautifully refurbished railroad bridges over deep valleys and several rail tunnels that add to the excitement of riding this well maintianed ~9 mile trail between Tunnel Hill, Illinois and Vienna, IL. 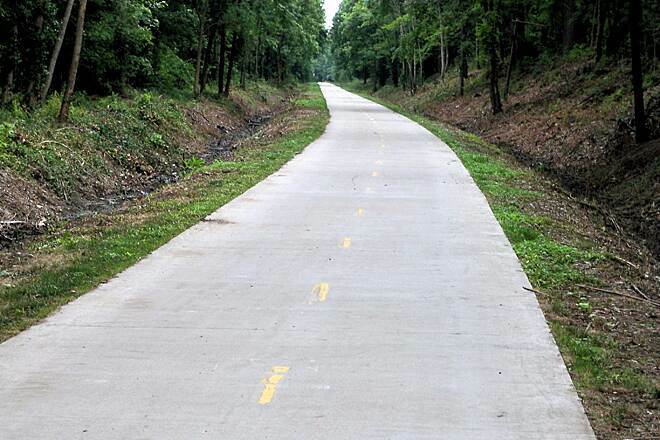 This trail will be one of the historic pieces of rail corridor linked into the developing Southern Illinois Regional Bicycle Trail that will ultimately provide an approximately 143 mile rail-trail system around southern IL." 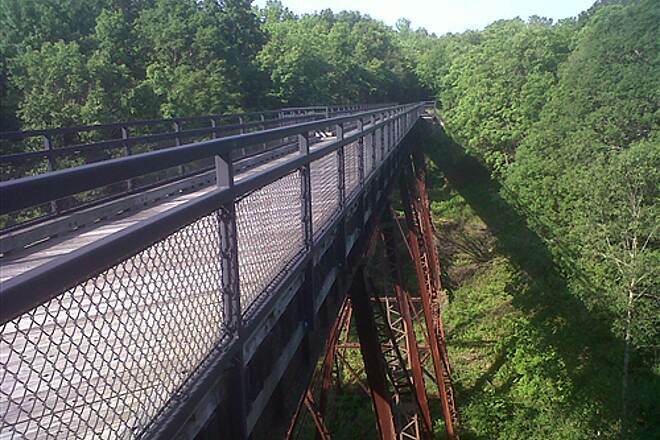 "As much as I like to see ""Brides with scenic overlooks"" I think you mean bridges...Trail is complete from Harrisburg, IL to Karnac, IL, approx 45 miles of Rails-to-Trails. Definitely worth the drive." 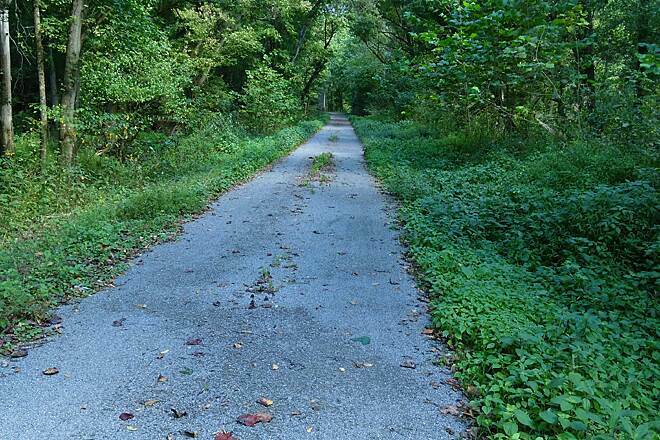 "Trail extends south to Vienna, IL, surface is crushed gravel. 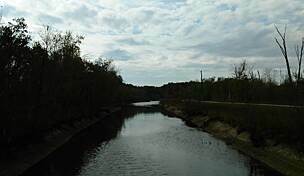 It is very nice for biking and hiking. Lots of brides with scenic overlooks and most grades are gradual climbs. Lots of wildlife to see."